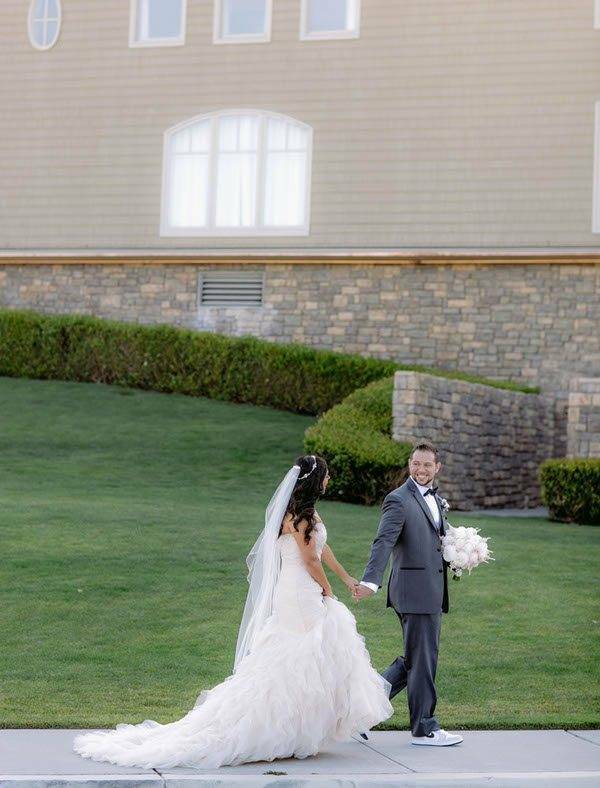 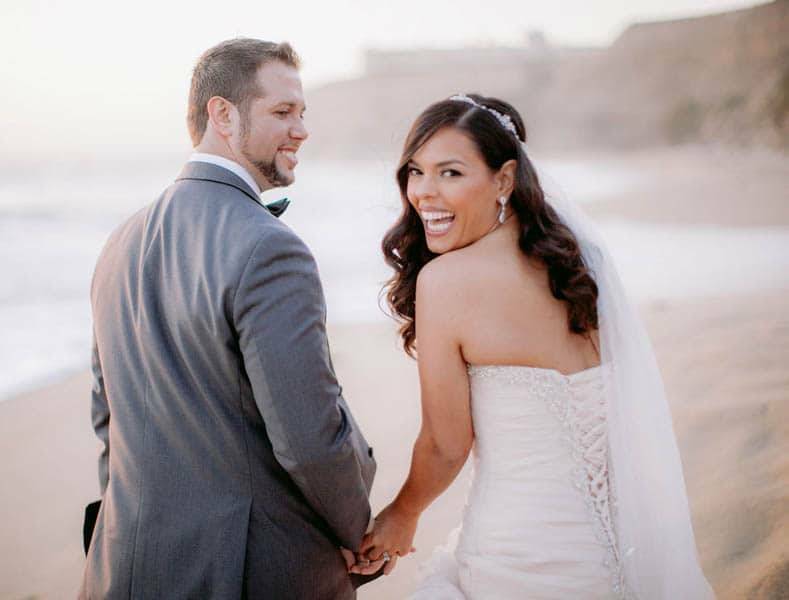 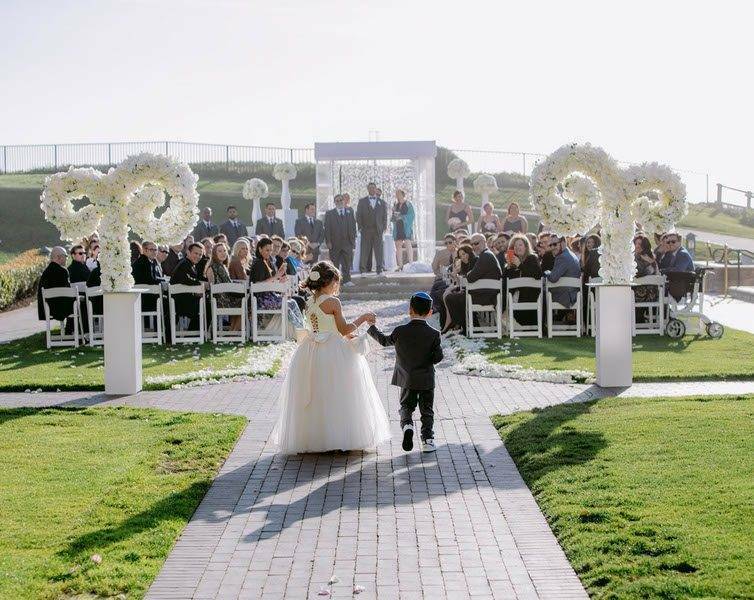 This incredible California wedding was a traditional event in a very modern location. 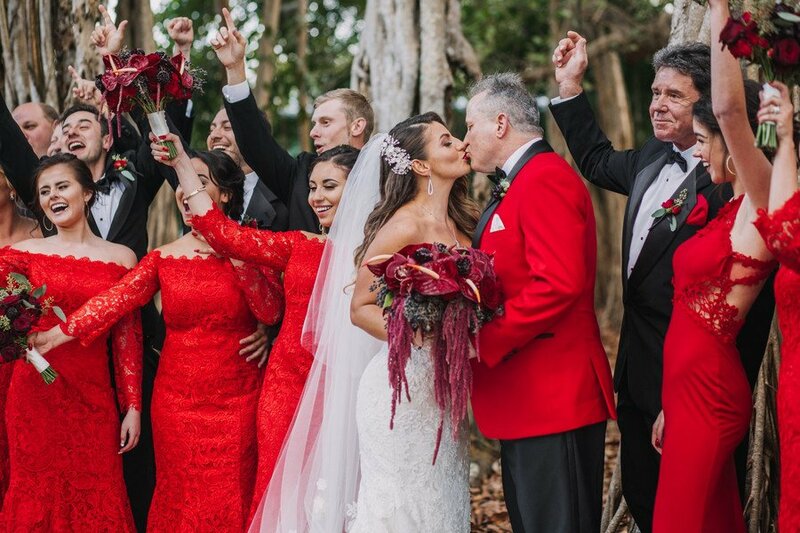 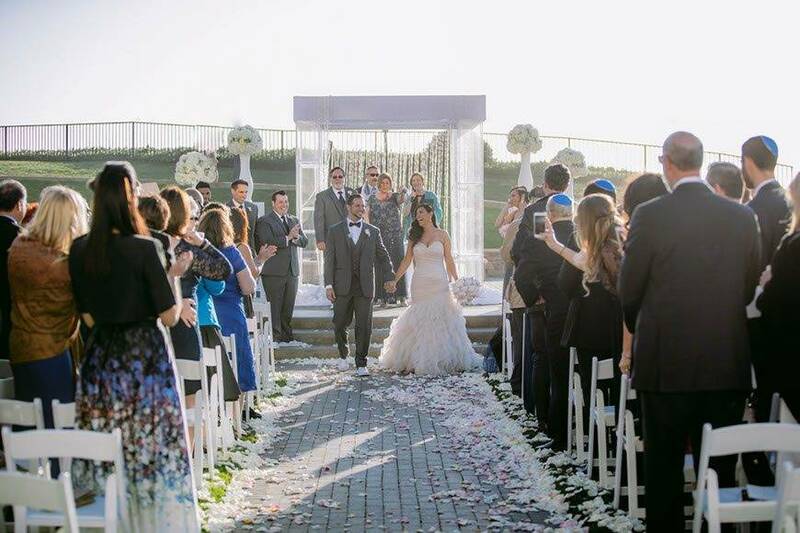 Michael and Michele combined a classic Jewish wedding – with all the bells and whistles – with their modern sense of style and theme. 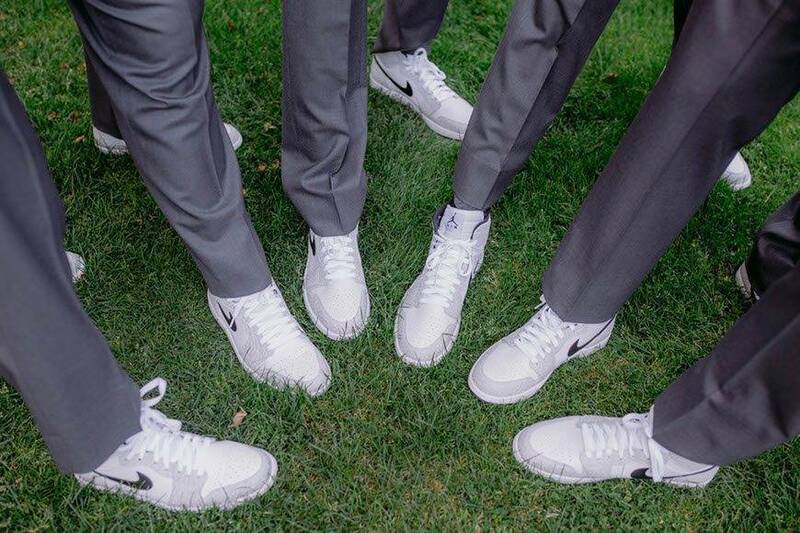 Michele wore a fairly traditional wedding dress, with her bridesmaids all dressed identically to each other, while Michael chose to pair his suit and Kippah (traditional Jewish headwear) with surprisingly new Nikes! 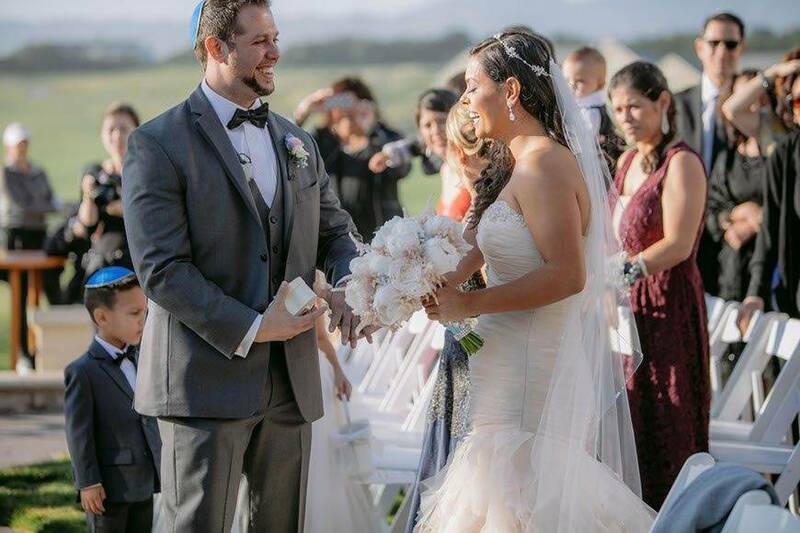 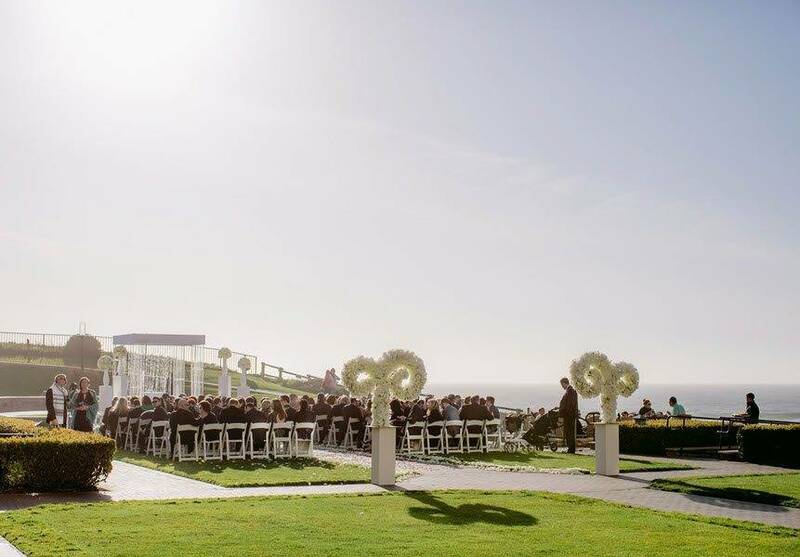 This outdoor wedding was a true celebration of love and faith, with an abundance of happy guests, on a gorgeous sunny day. 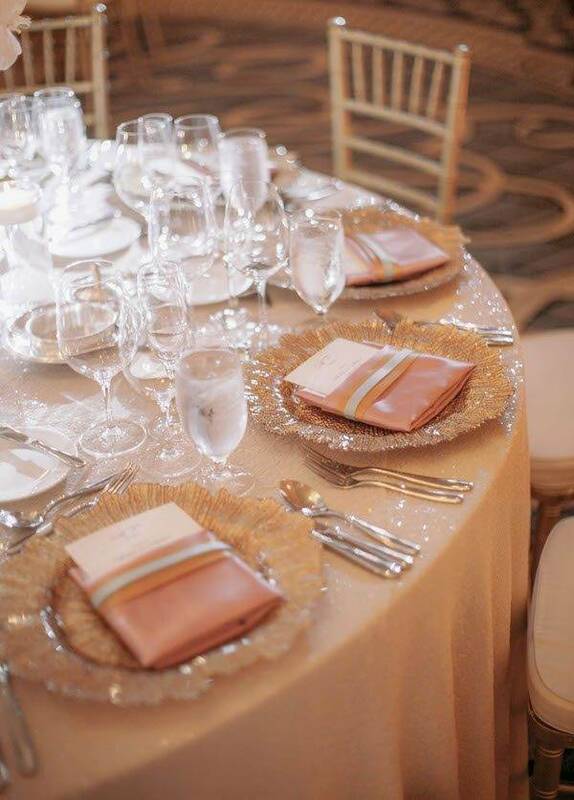 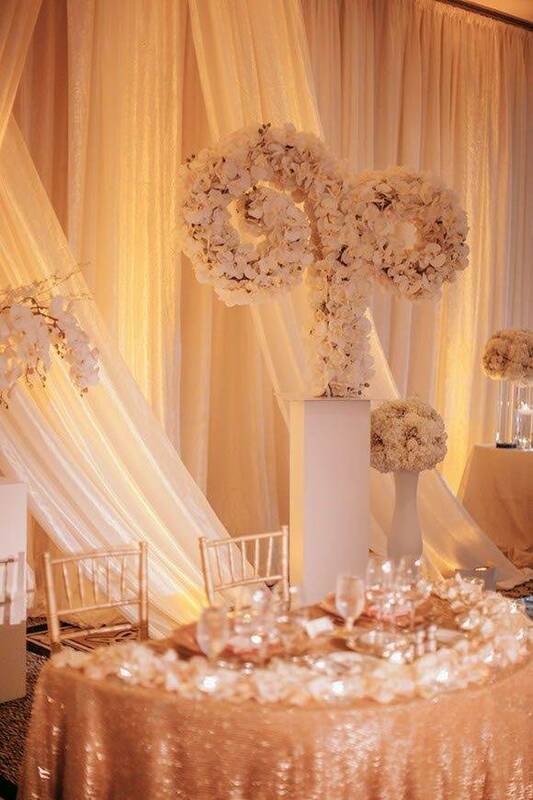 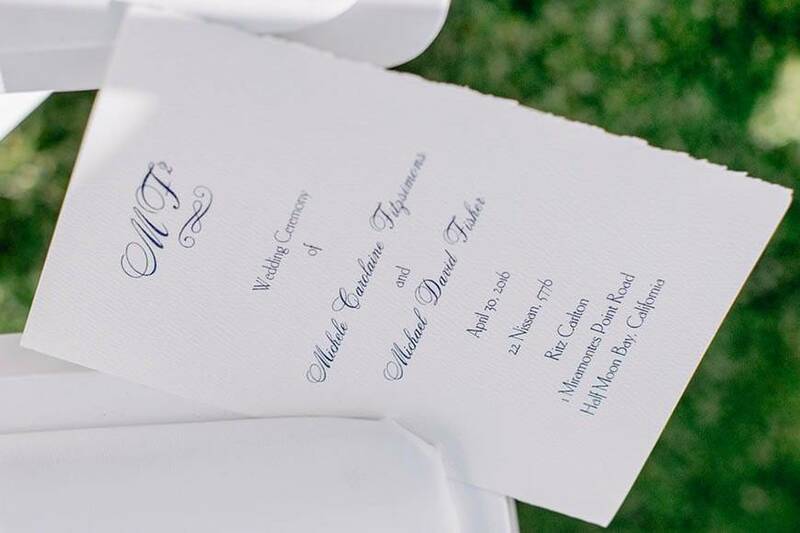 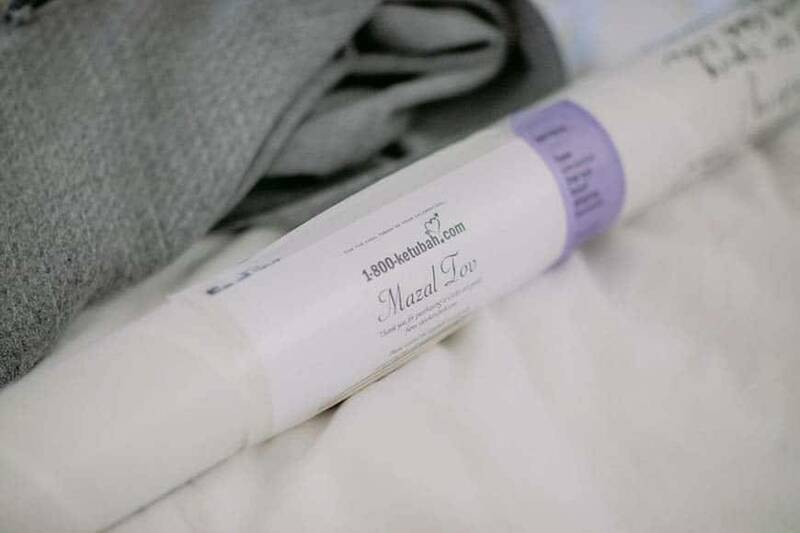 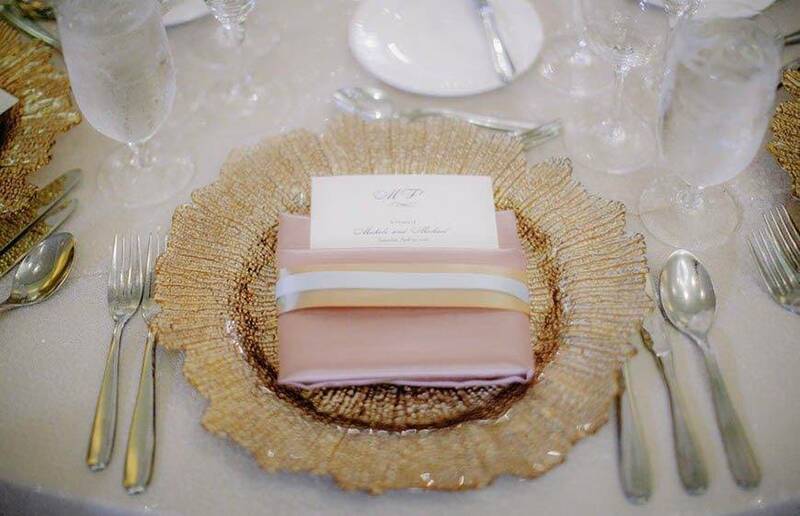 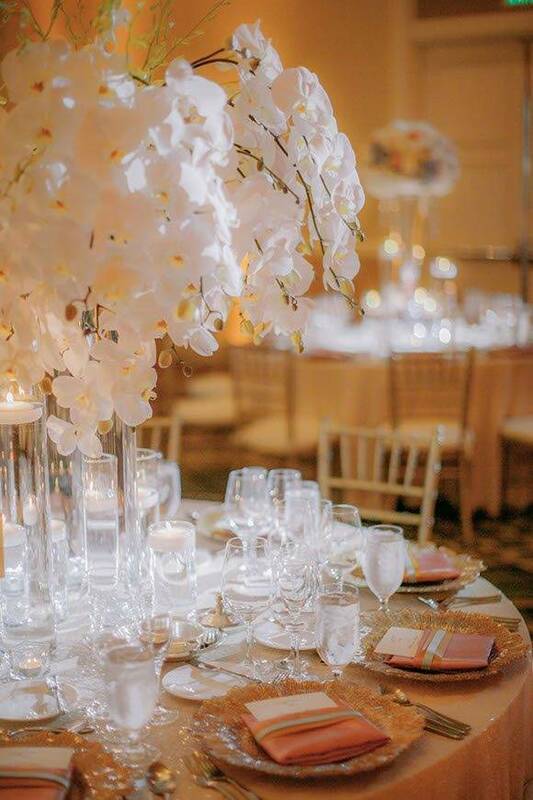 Aside from incorporating their faith, Michael and Michele stuck to a fairly simple theme, using a colour scheme with predominantly in light hues of ivories, champagnes and pinks. 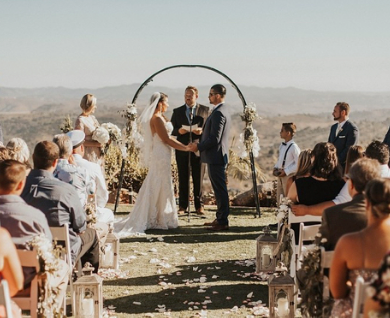 They also opted for the simplicity of holding the ceremony and the reception at the same venue – there was absolutely nothing complicated about this wedding, even the cake was traditionally beautiful. 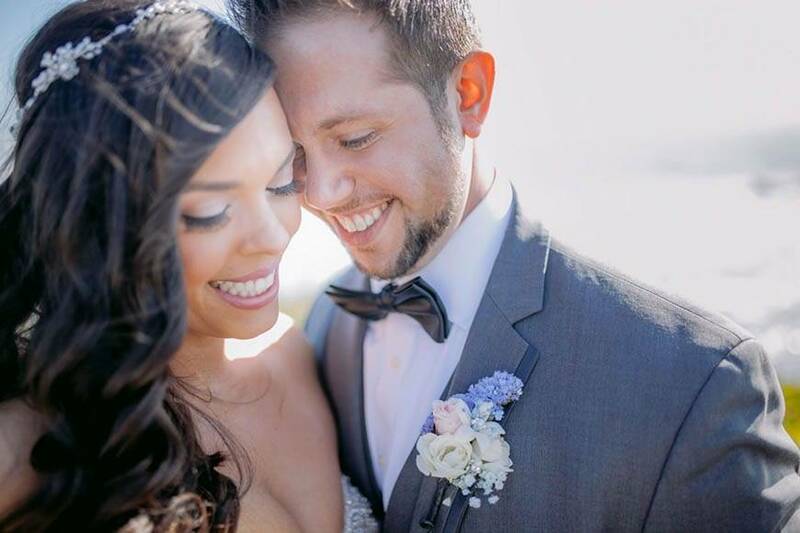 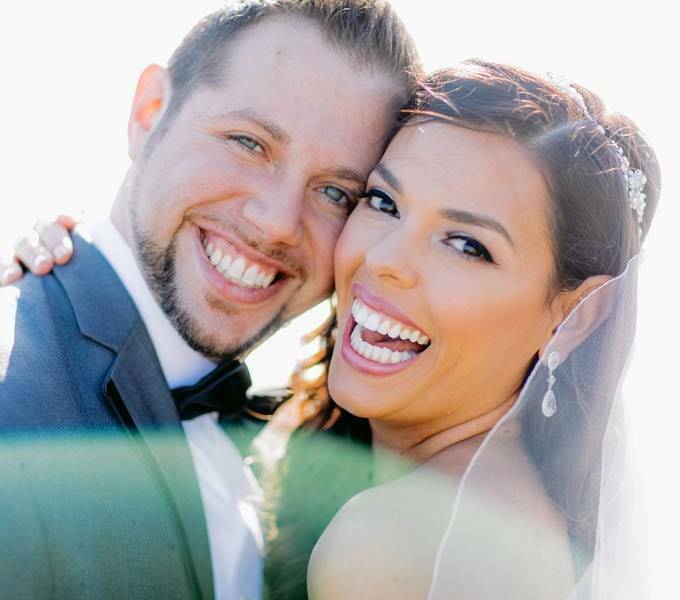 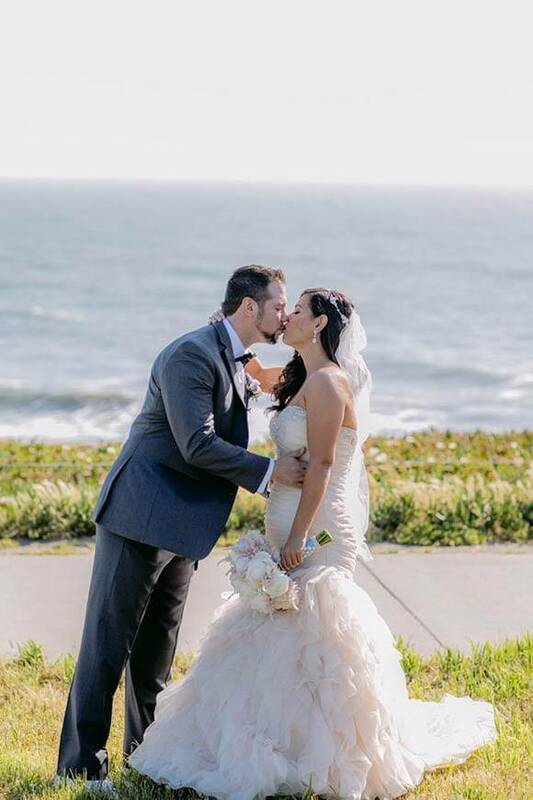 Michele and Michael first met while working for the same company in San Francisco. 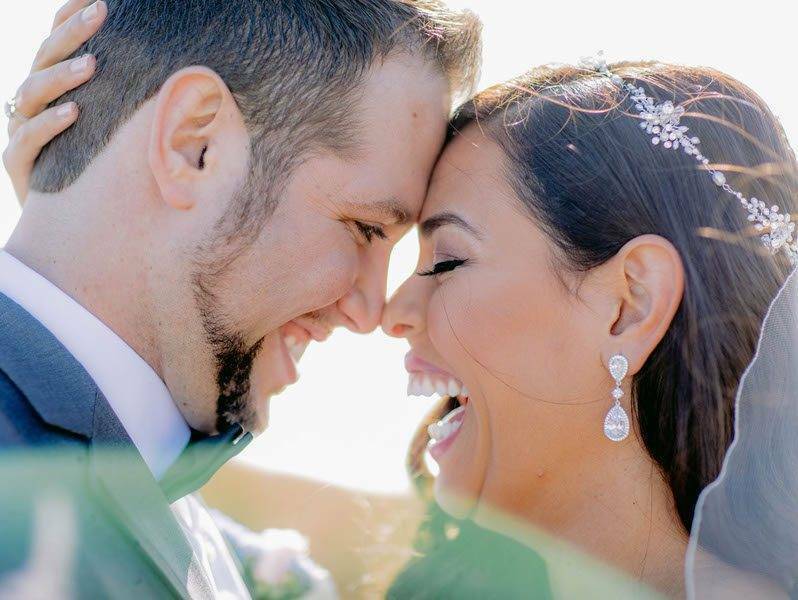 18 months pass… and social media reconnected them – just goes to show the power of the internet. 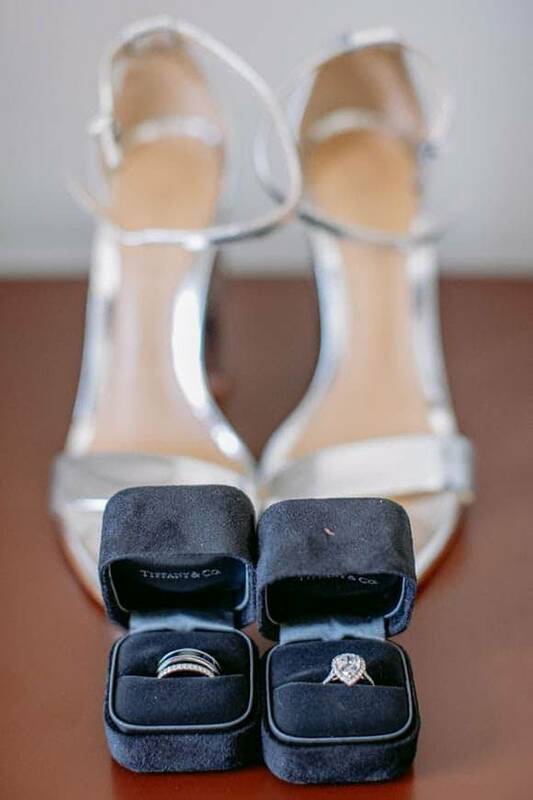 Their first date was originally for professional networking purposes, but this meeting of minds then turned into and evening-long conversation about all their common interests. 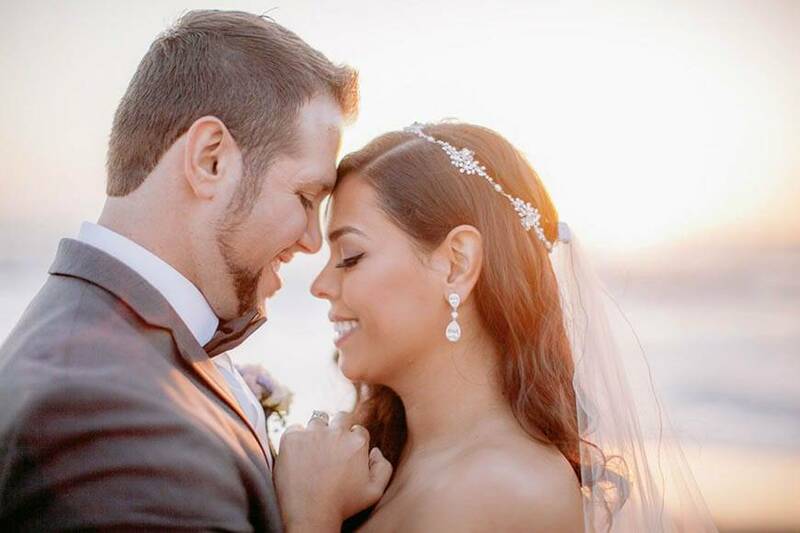 After a few years of blissful dating, they took a cruise ship vacation in the Caribbean. 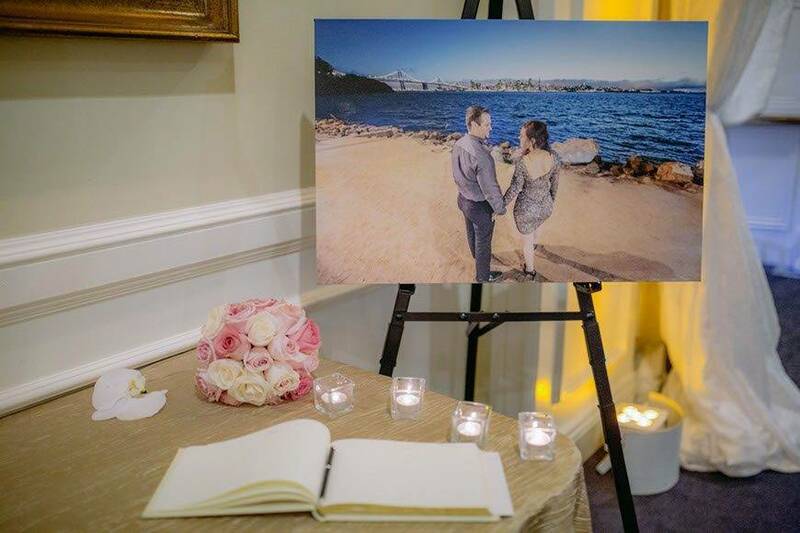 It was during this holiday that their proposal took place, in a delightful Italian restaurant, on Valentine’s Day of all days. 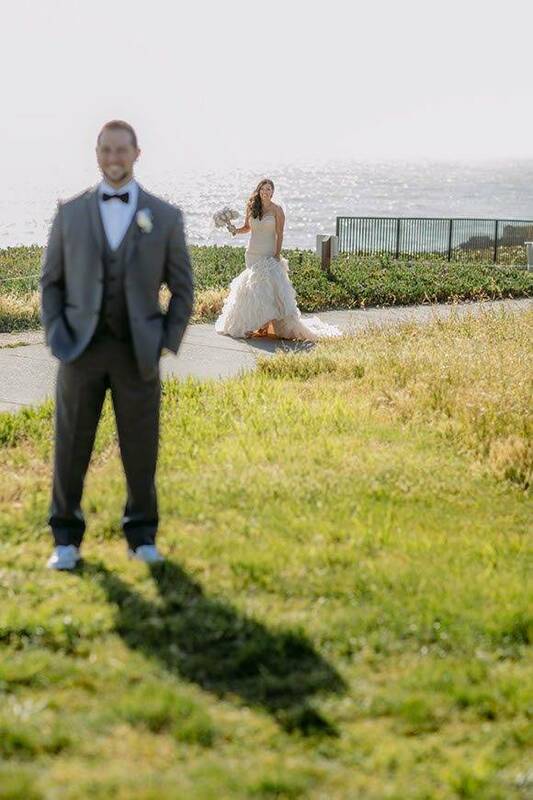 Cunning groom-to-be Michael successfully planned to sneak his family on board their cruise ship, directly behind Michele for the duration of their meal (unbeknownst to her). 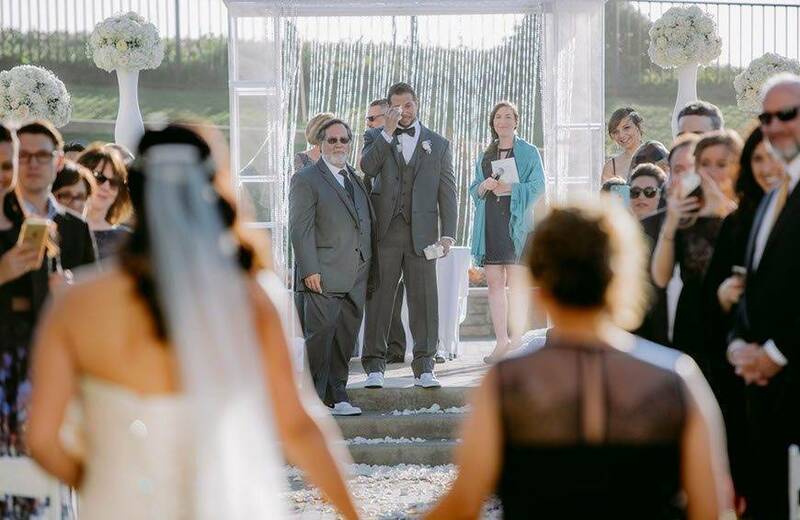 As he got down on one knee after promising to be the husband Michele had always dreamed of, the entire restaurant stood up and applauded when she immediately said, “YES!”. 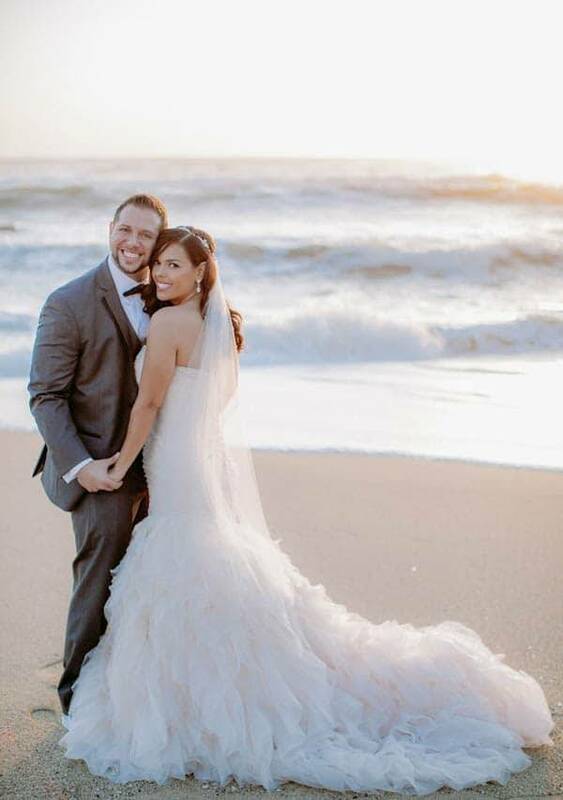 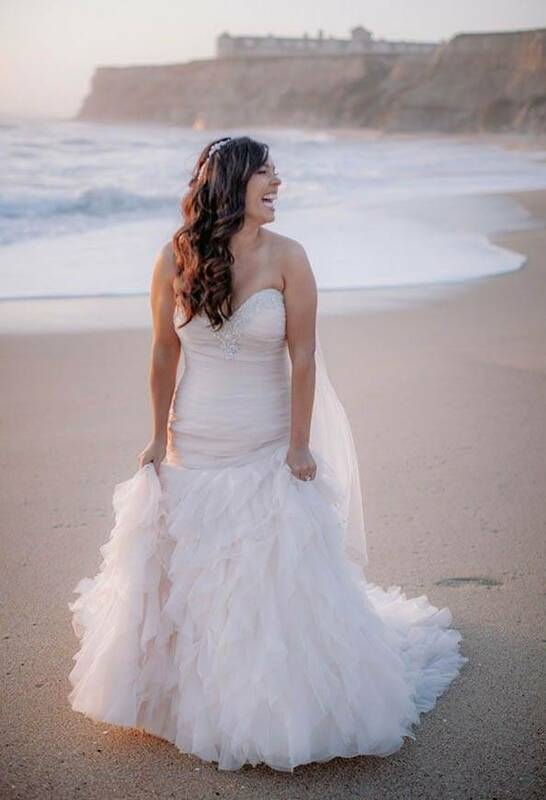 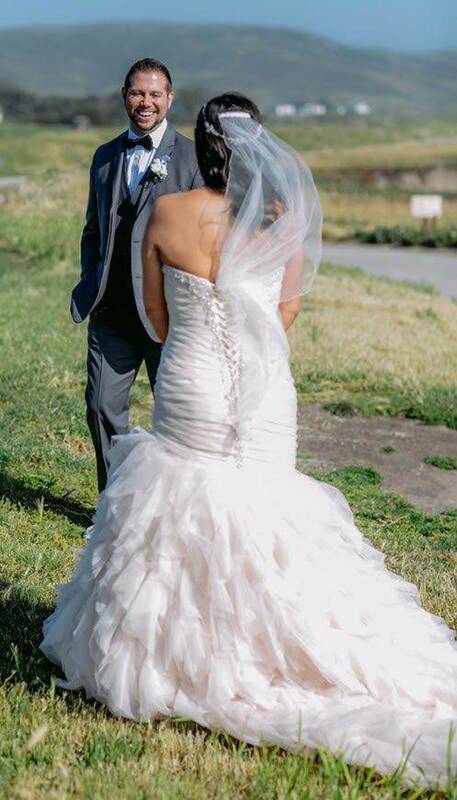 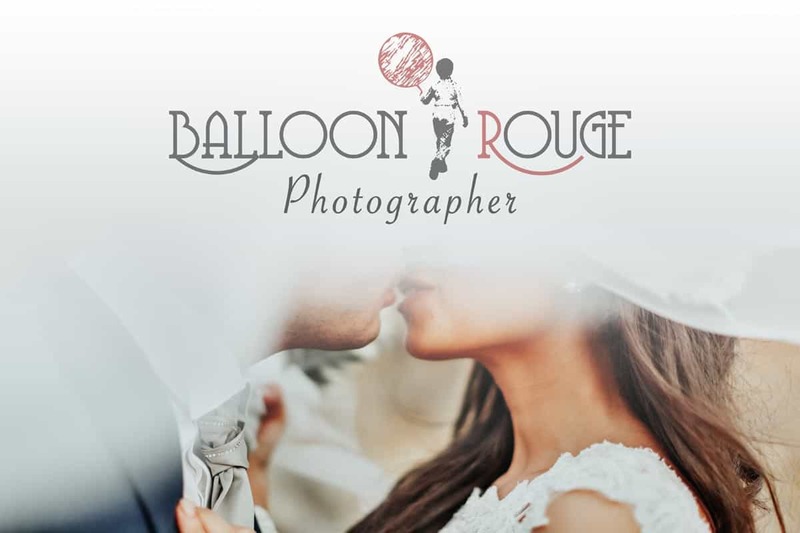 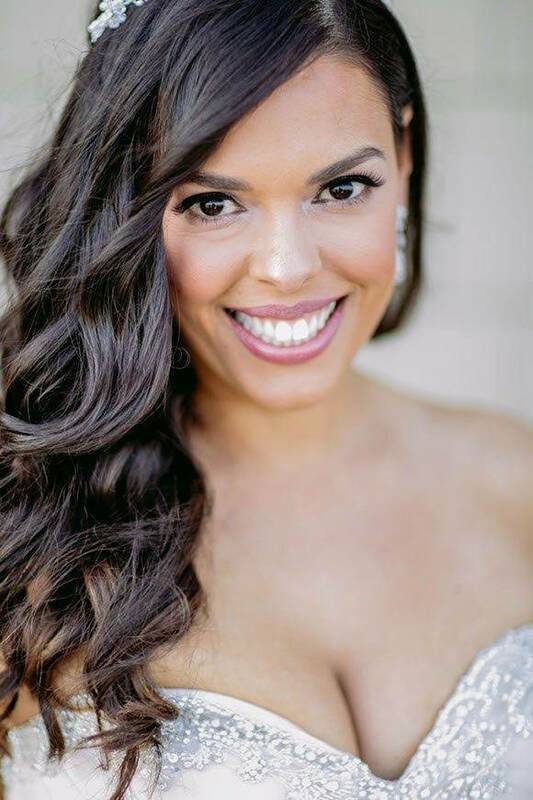 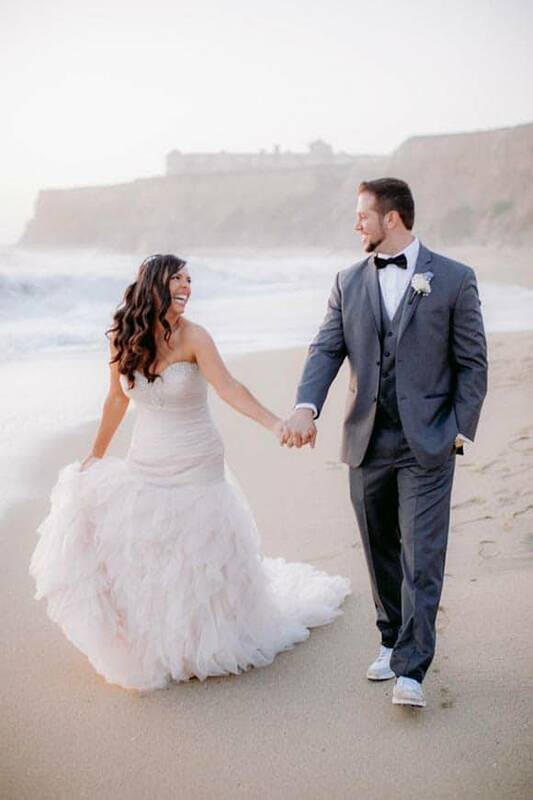 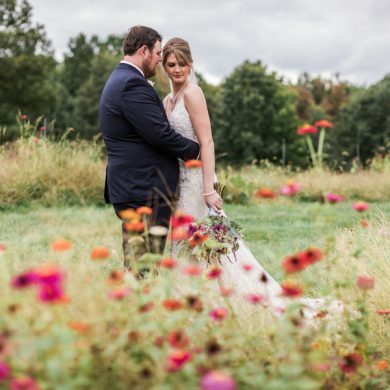 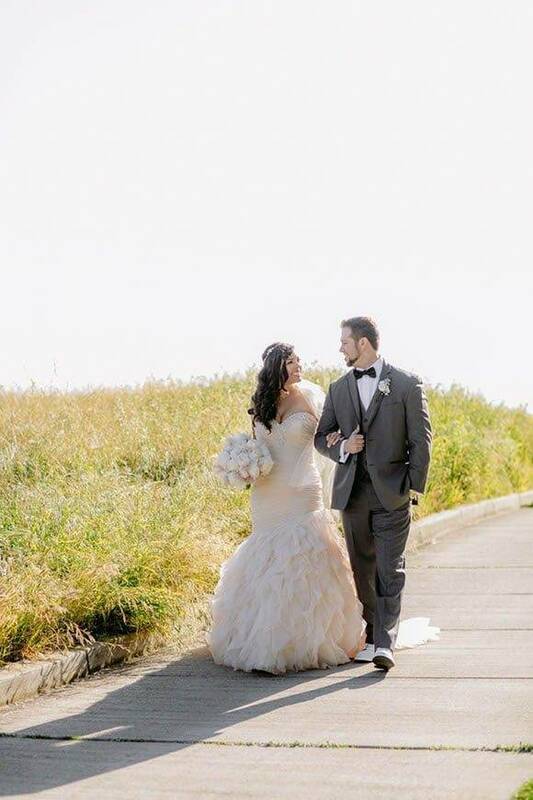 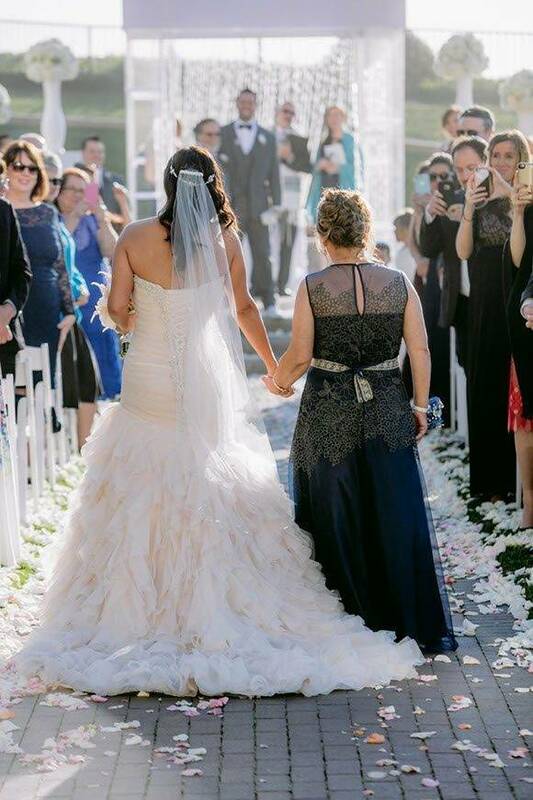 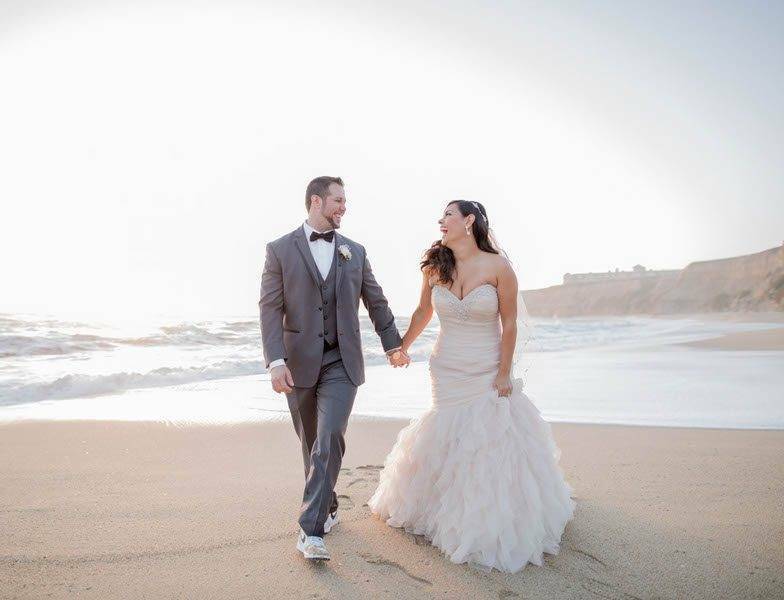 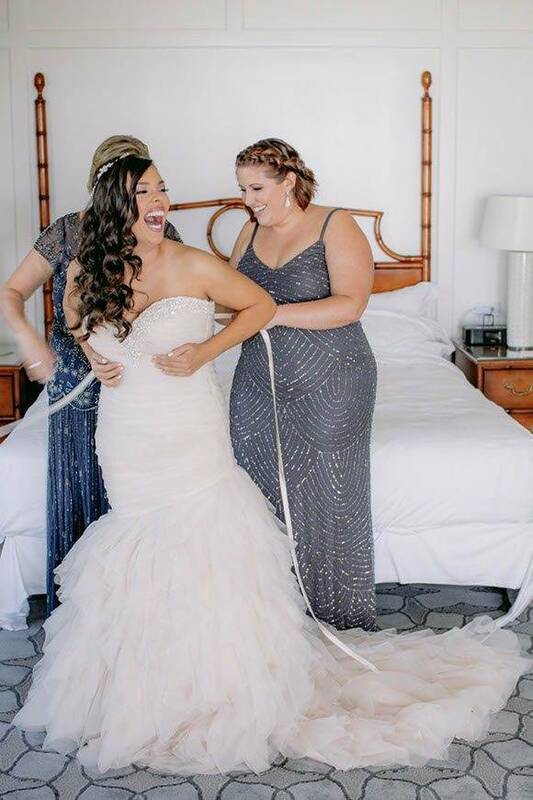 Michele wore a stunning champagne-hued strapless dress from Allure Bridals, with a sweetheart neckline, jewel details and flowing tulle skirting. 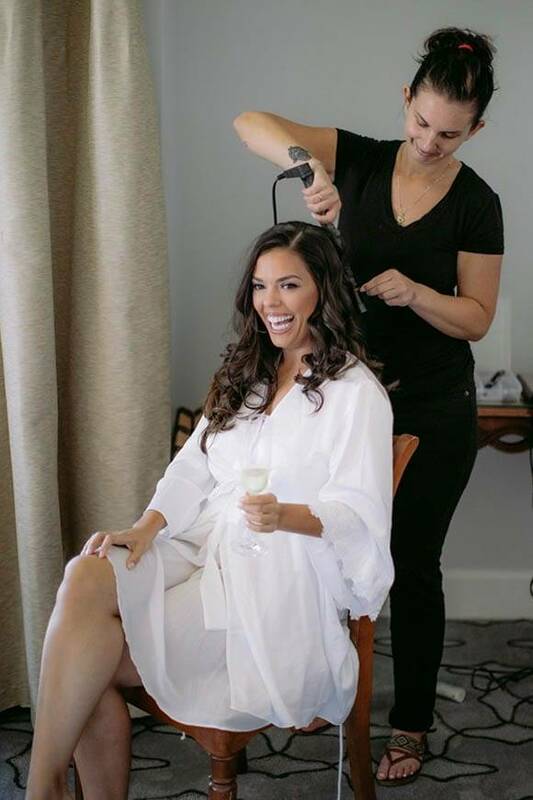 The high-low style of the skirt allowed Michele to show off her tanned legs and silver strappy sandals. 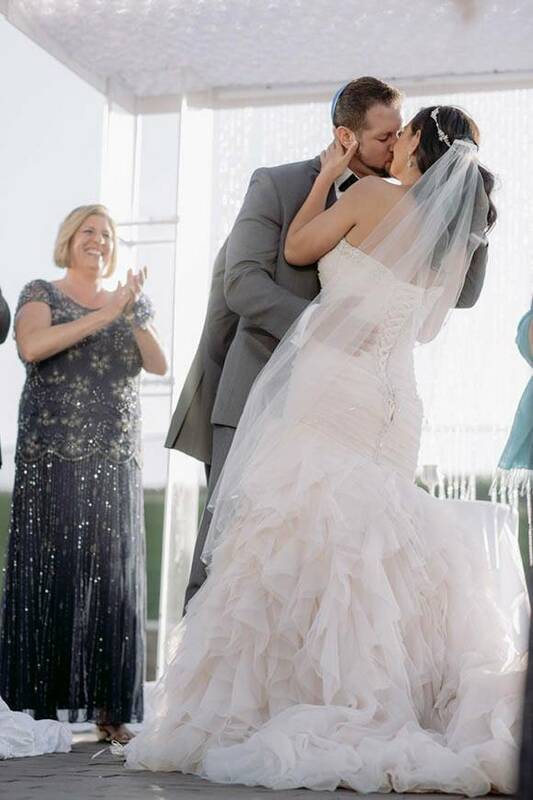 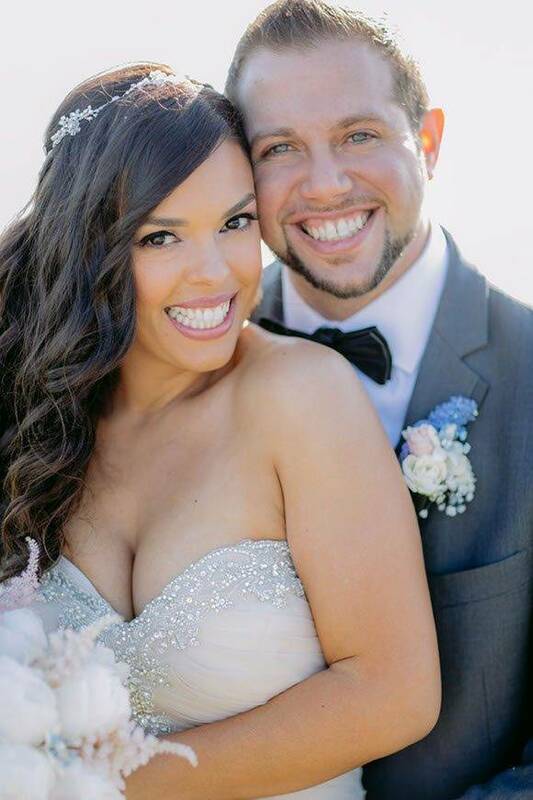 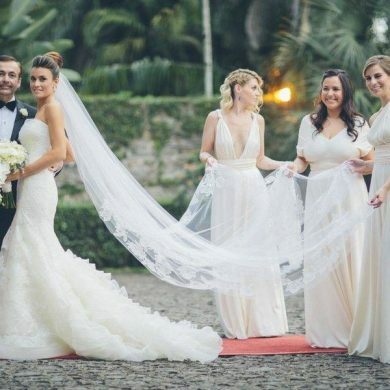 Michele’s simple yet stylish halo headpiece and veil from Trudys Brides was the icing on the cake. 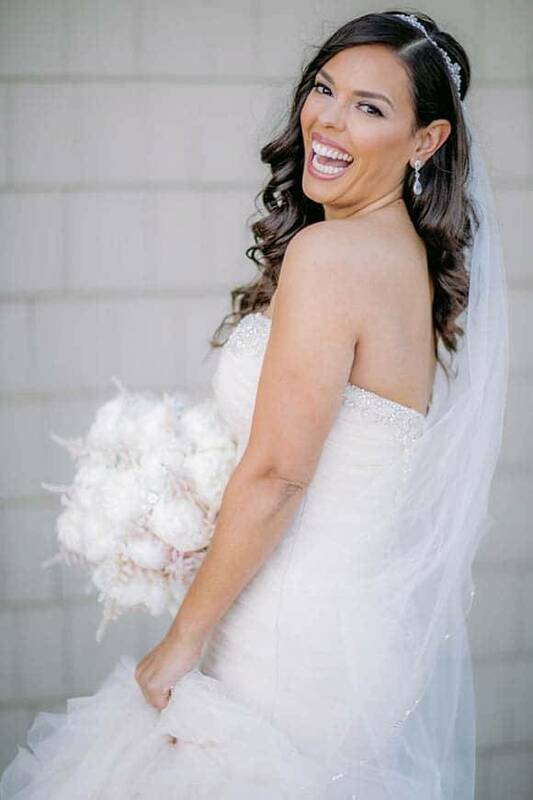 She added some beautiful teardrop earrings to the outfit for an extra touch of sparkle. 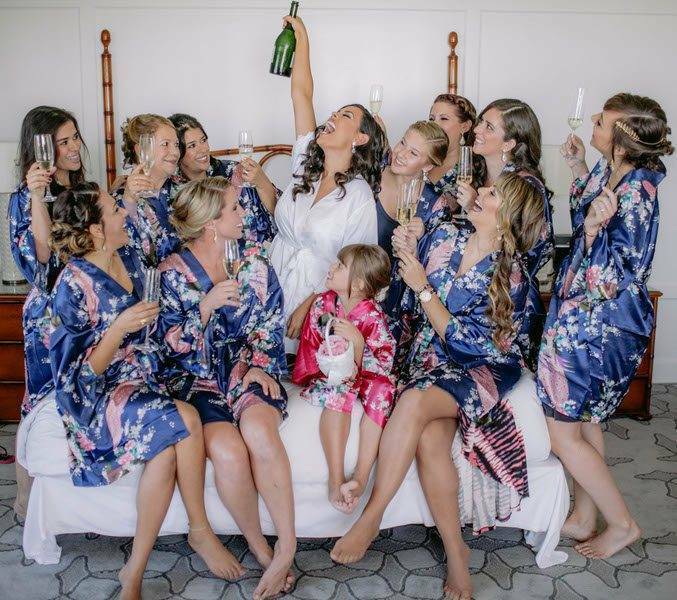 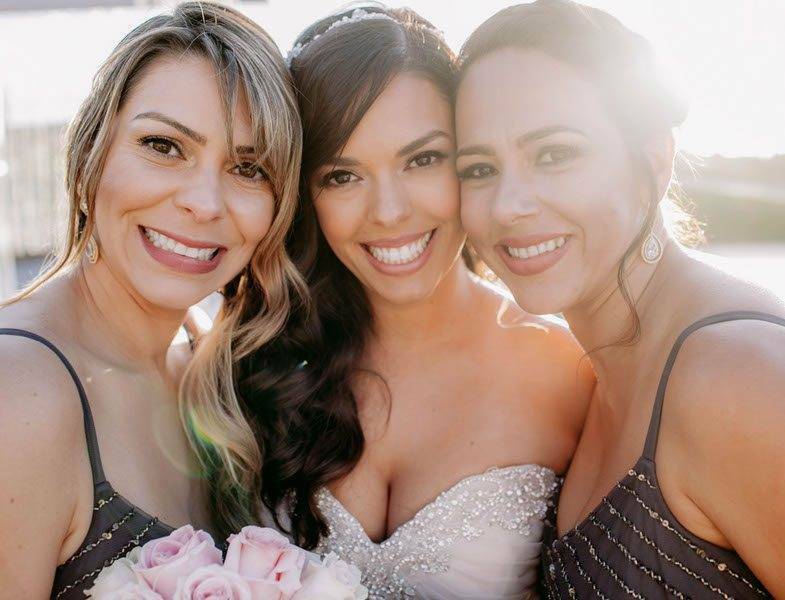 Michele had her flowing brunette locks meticulously curled, while her bridesmaids were treated to delicately-styled braided updos. 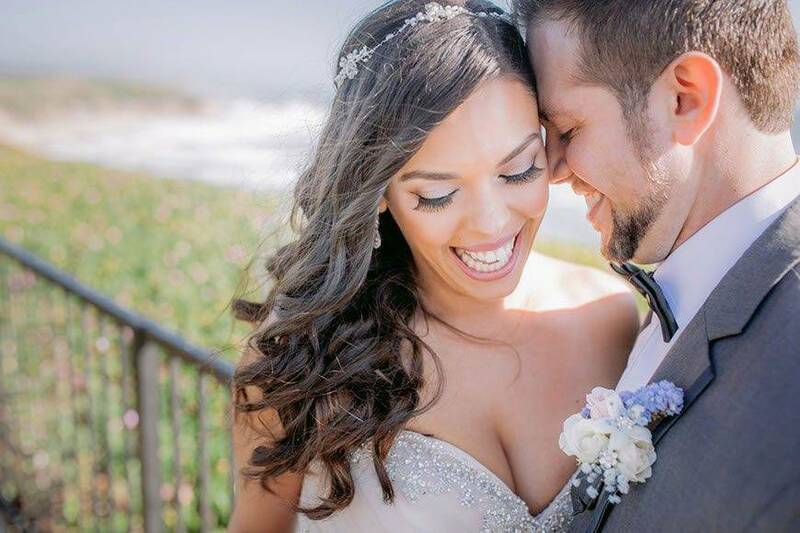 Michele opted for a light and fairly natural makeup look, with natural brows, a slightly frosty pink lip, and a touch of winged eyeliner. 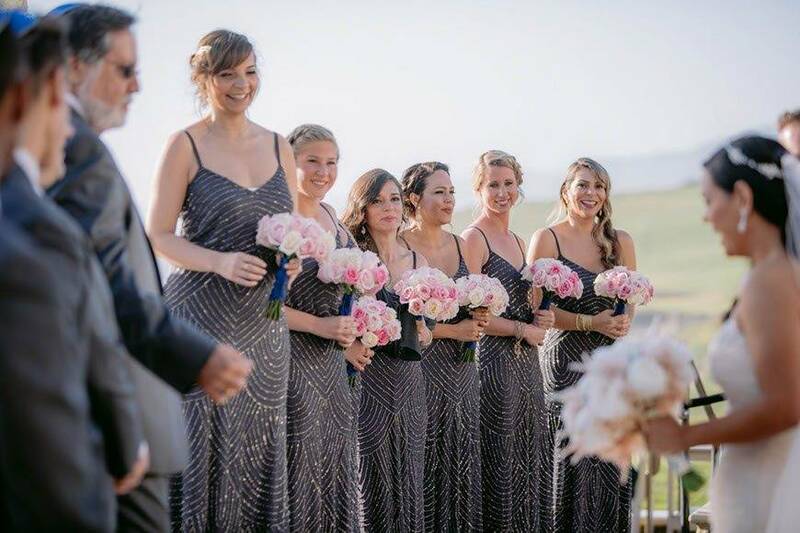 Her bridesmaids, though all different shapes and sizes, looked equally stunning in 1920’s inspired charcoal and silver flapper-style dresses, matching their delicate hairstyles perfectly. 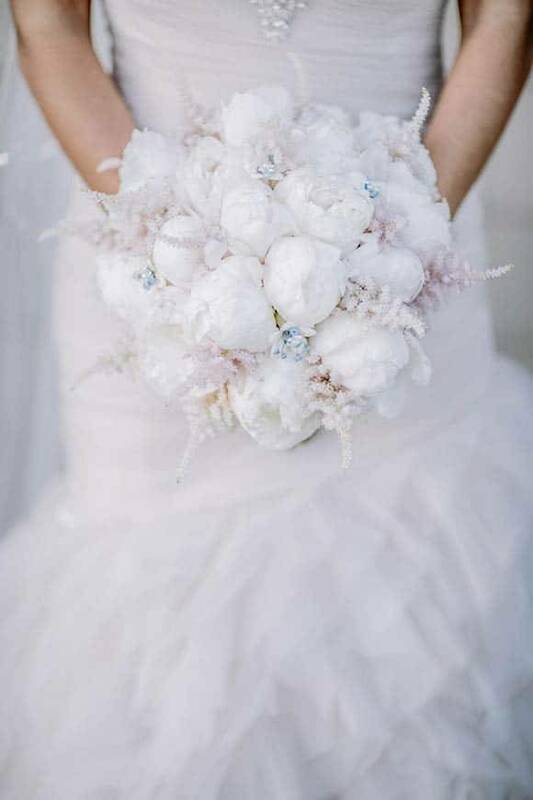 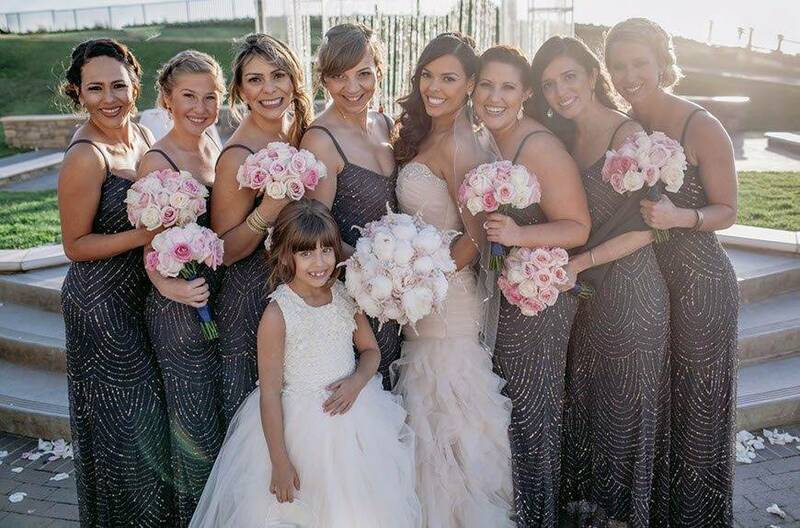 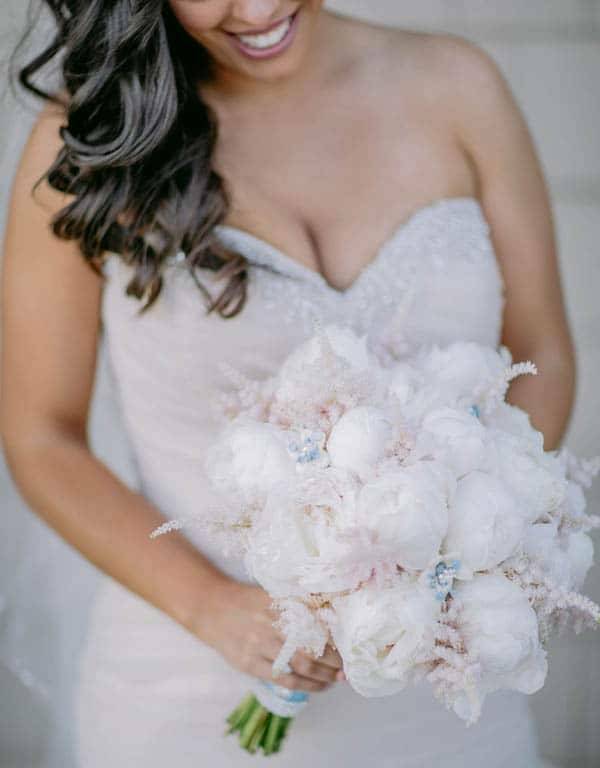 To match the hue of her dress, Michele chose to carry a small champagne bouquet, while her bridesmaids carried light pink arrangements, all from Flowers By Edgar. 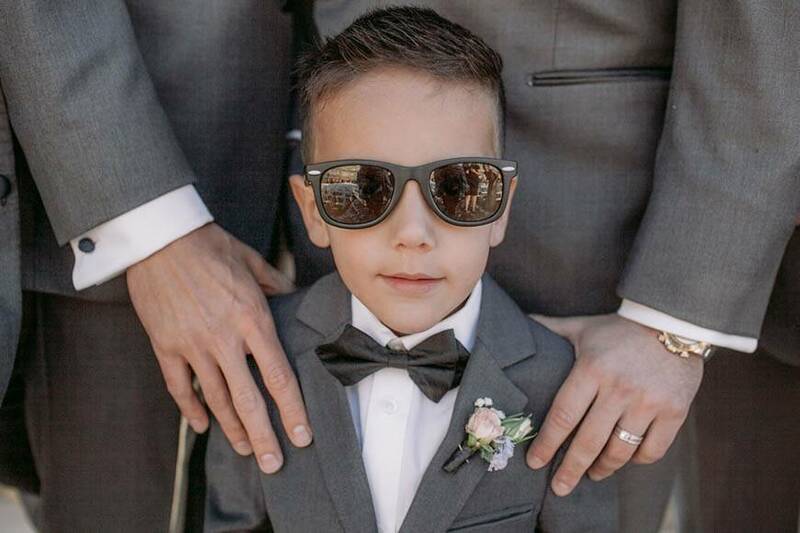 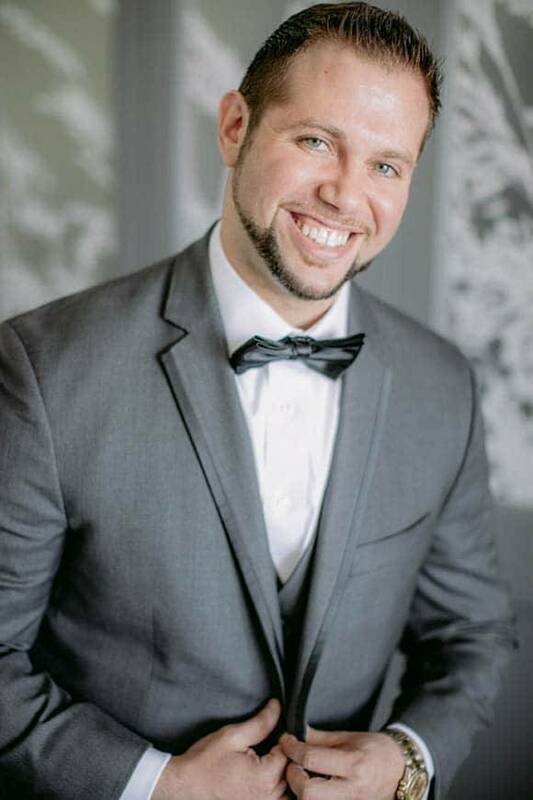 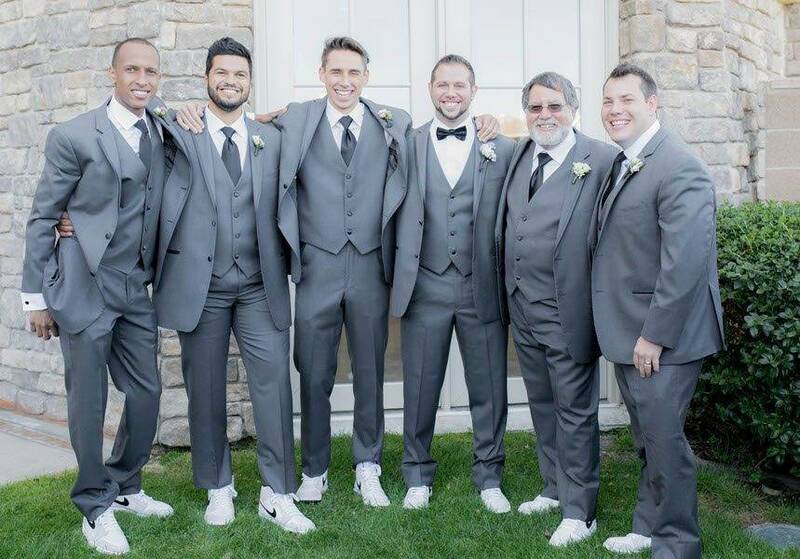 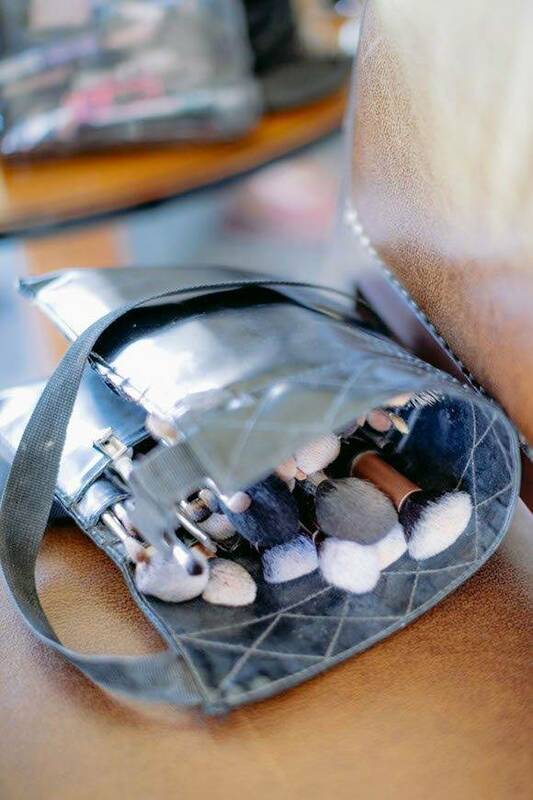 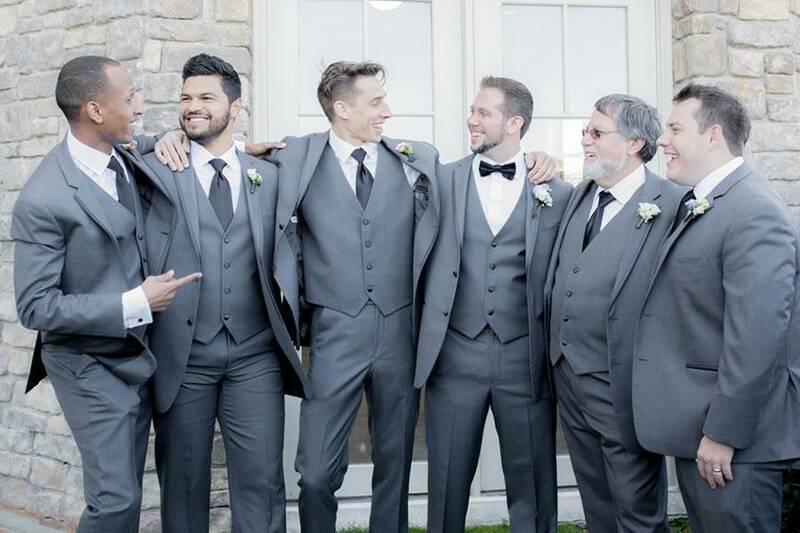 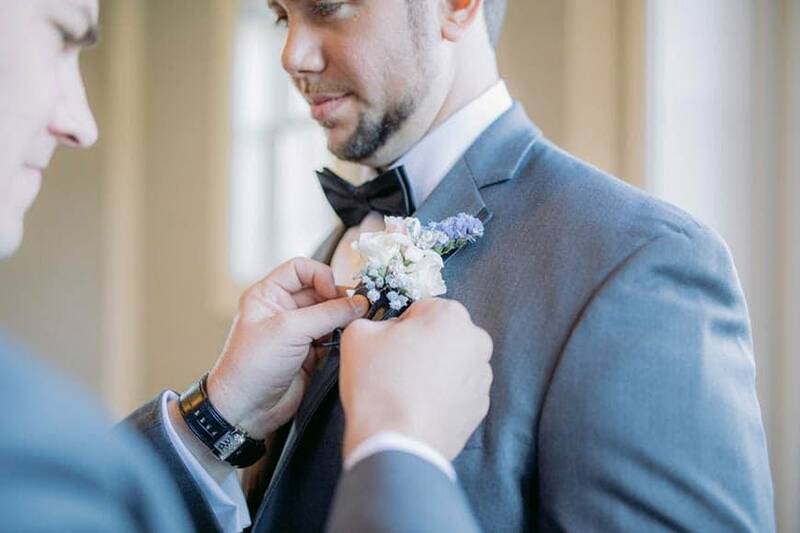 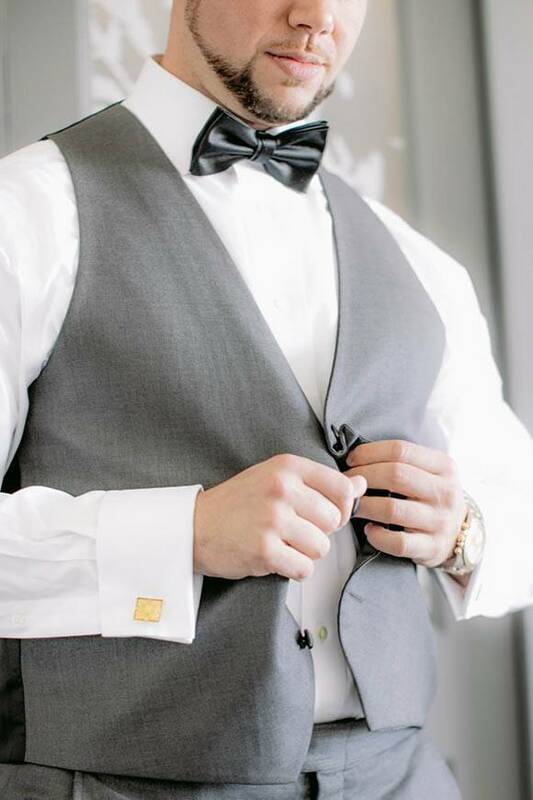 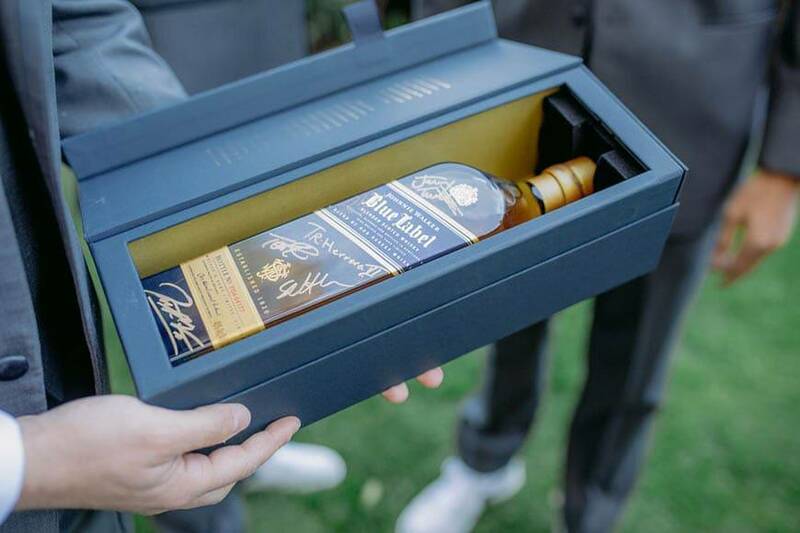 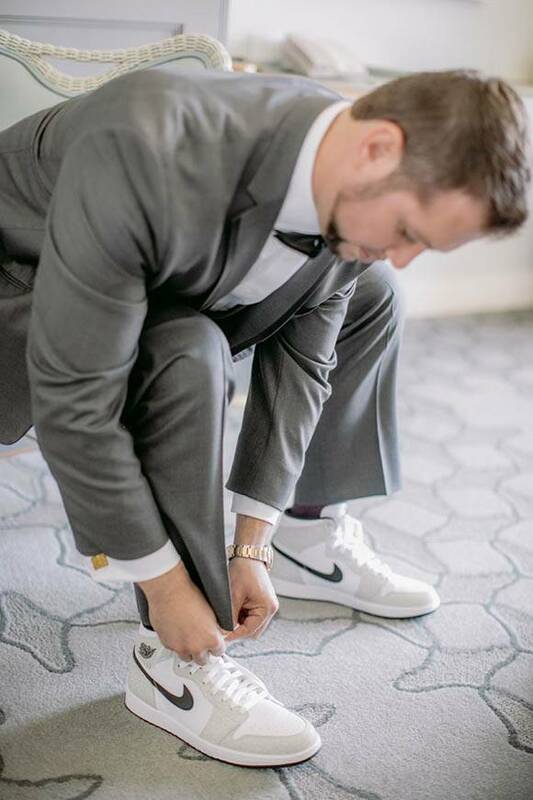 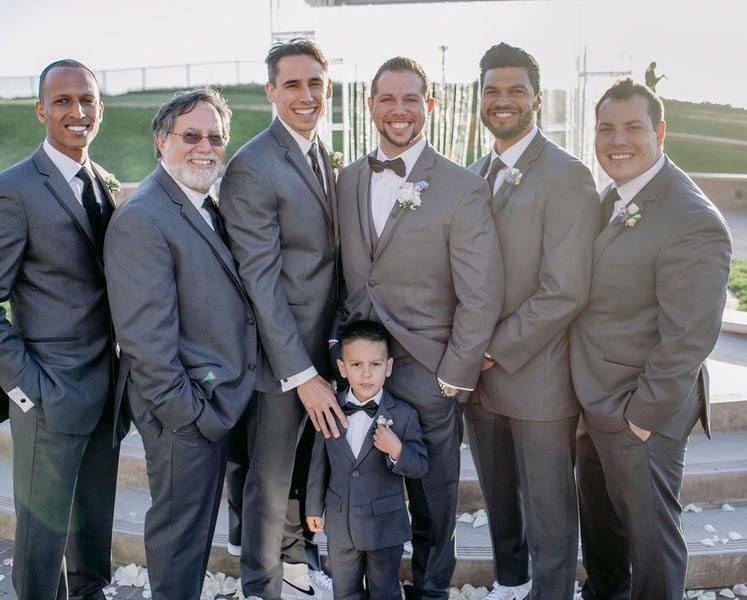 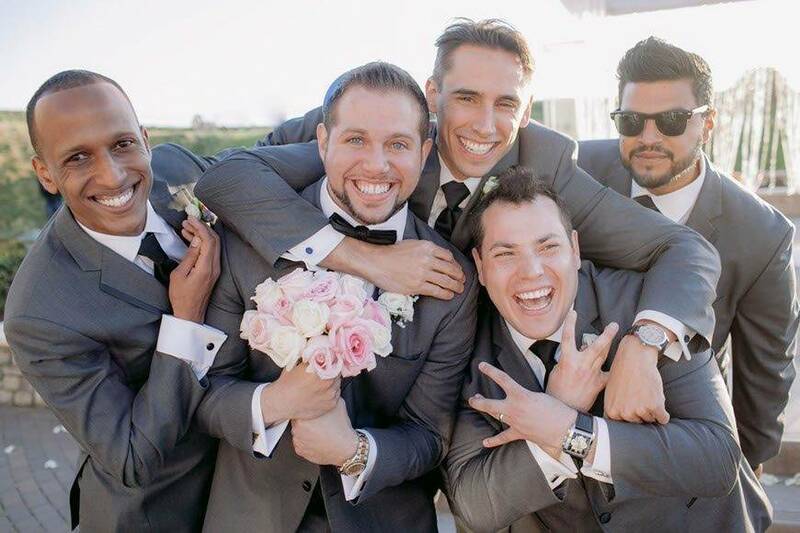 Michael and his groomsmen opted for a very interesting styling choice – while they wore charcoal suits and ties (with Michael sporting a bow tie) with pale boutonnieres, they also collectively wore matching Nike trainers (or sneakers, as they might call them). 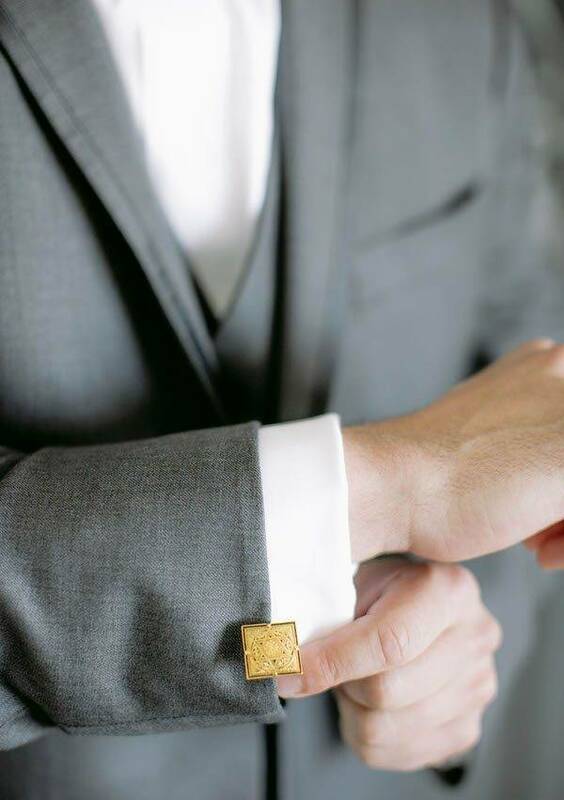 Michael then topped this off with a gold watch and square gold cufflinks featuring the Star of David, for a classy feel. 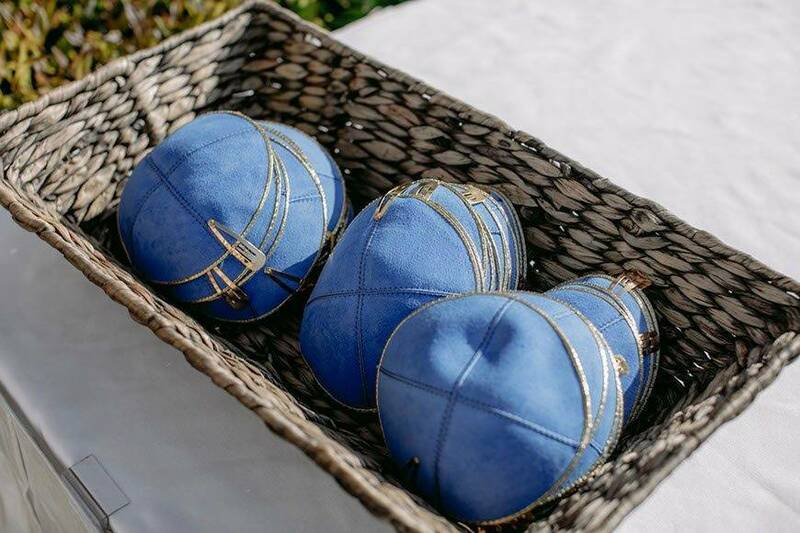 During the ceremony, they also wore royal blue Kippahs, in keeping with Michael’s Jewish faith. 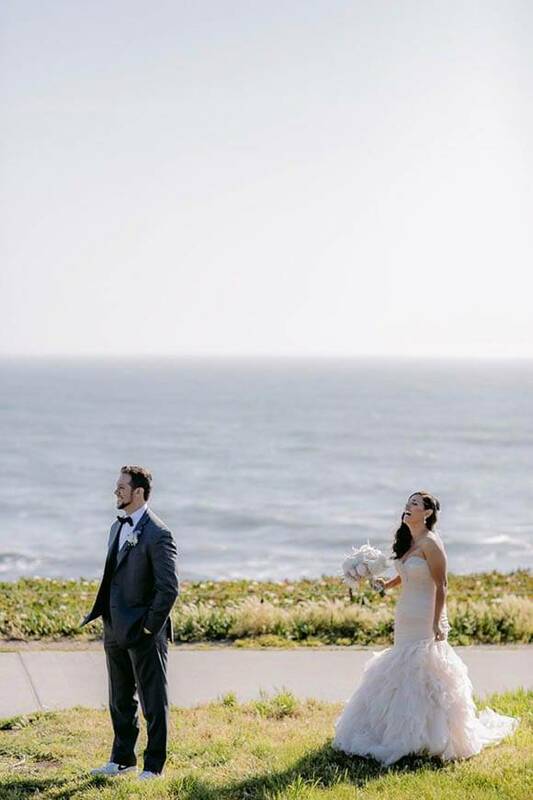 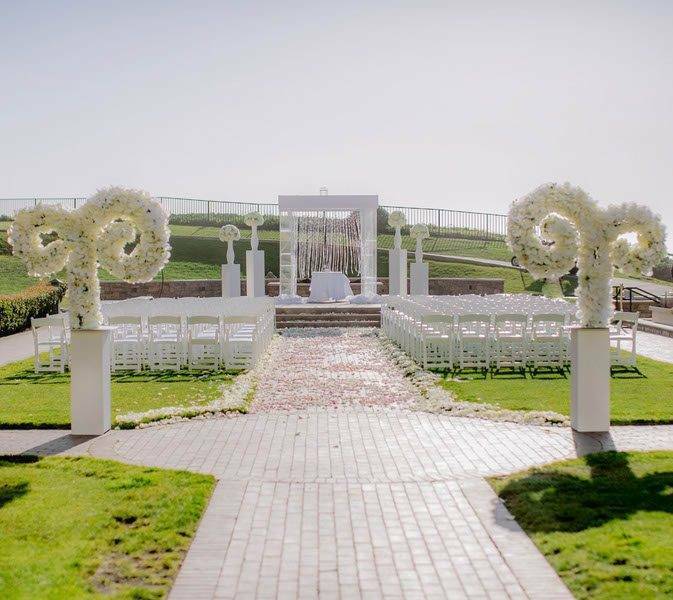 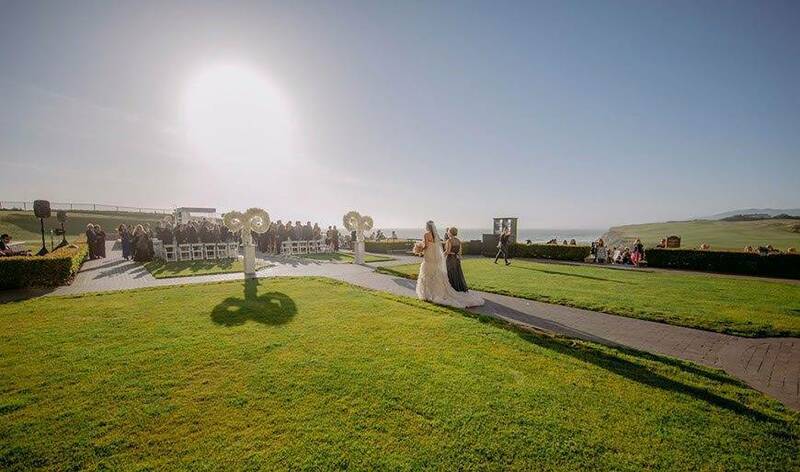 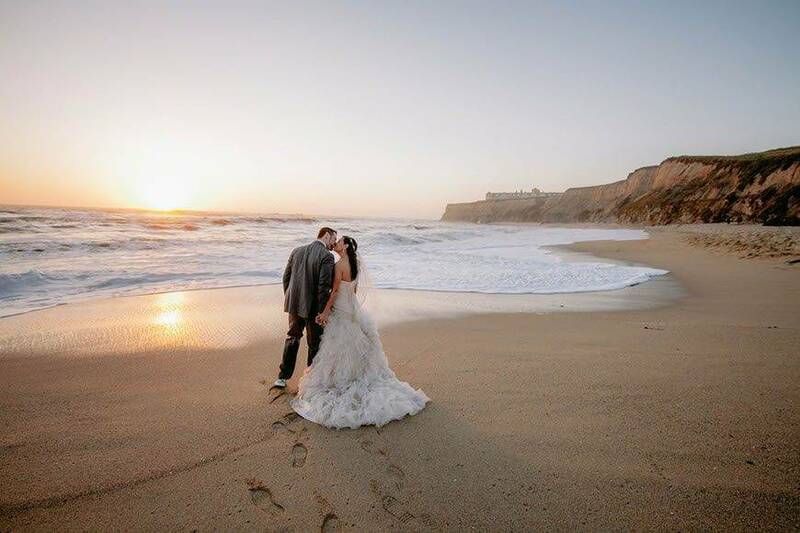 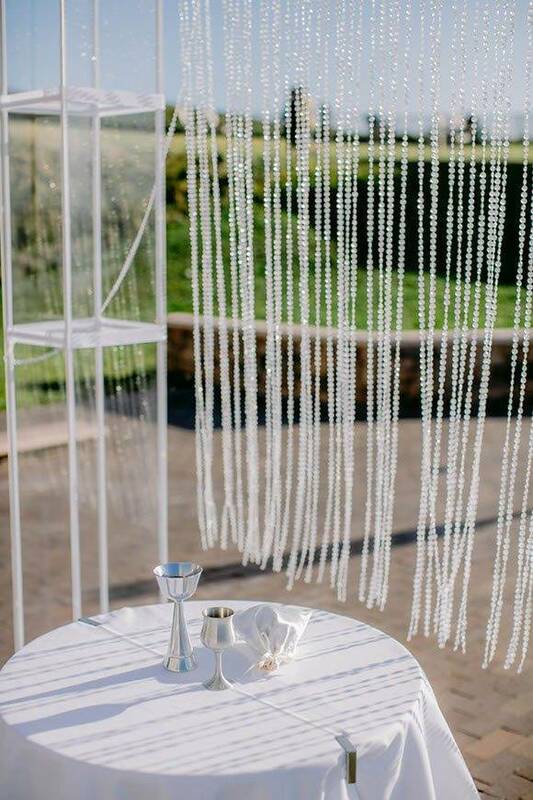 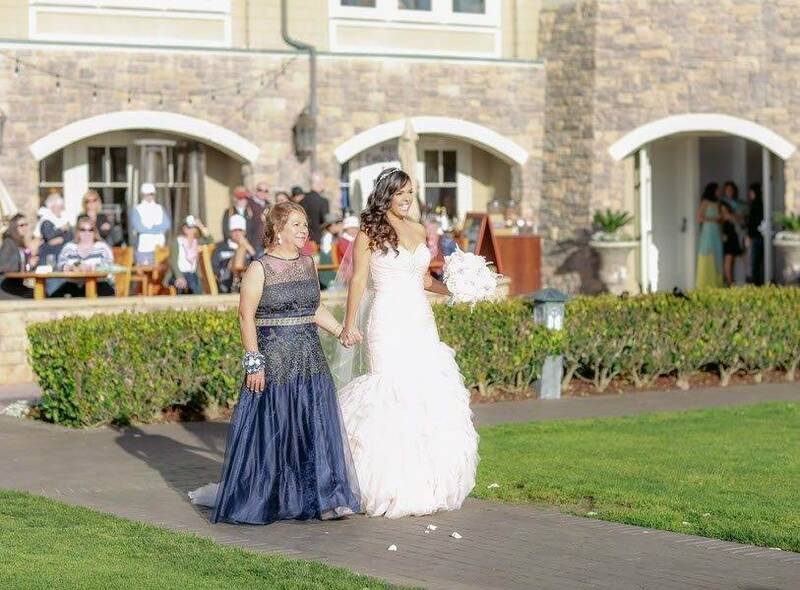 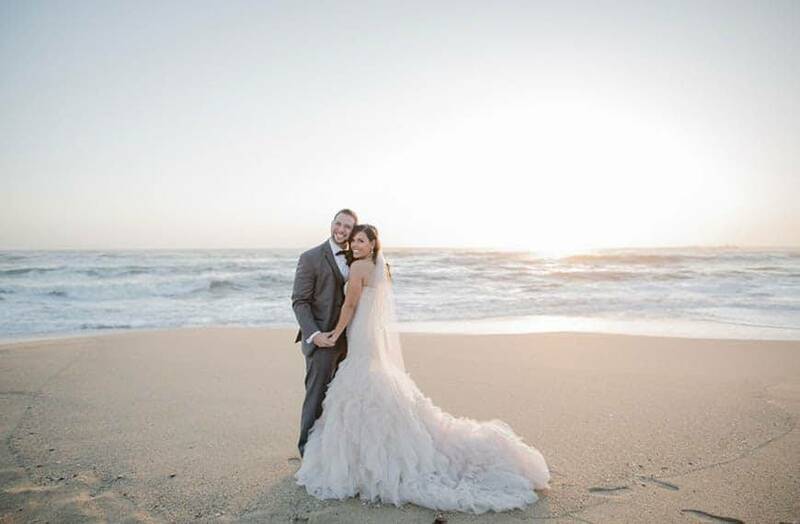 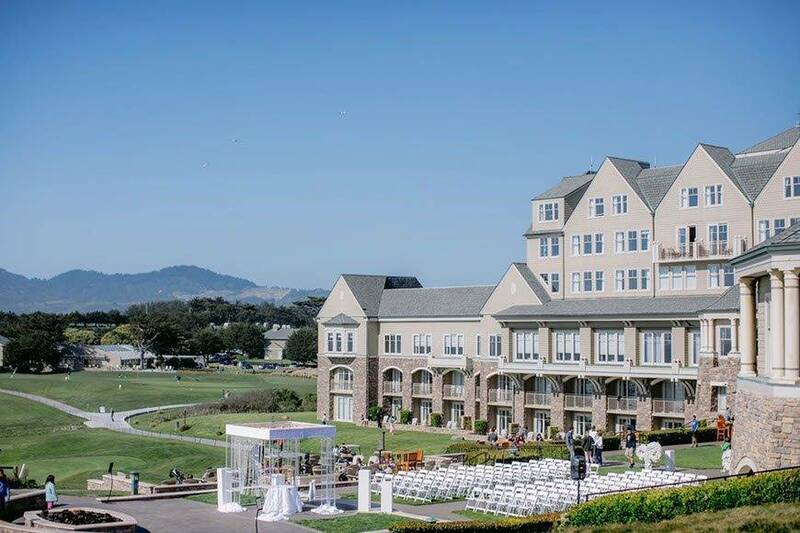 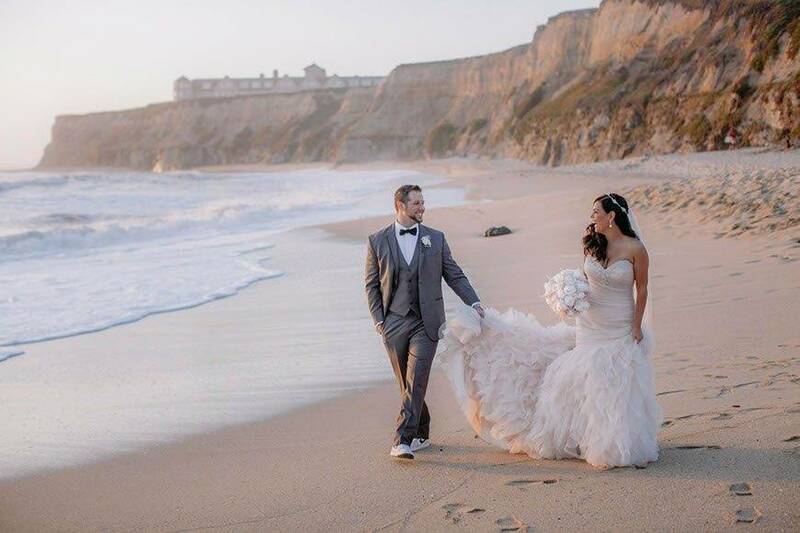 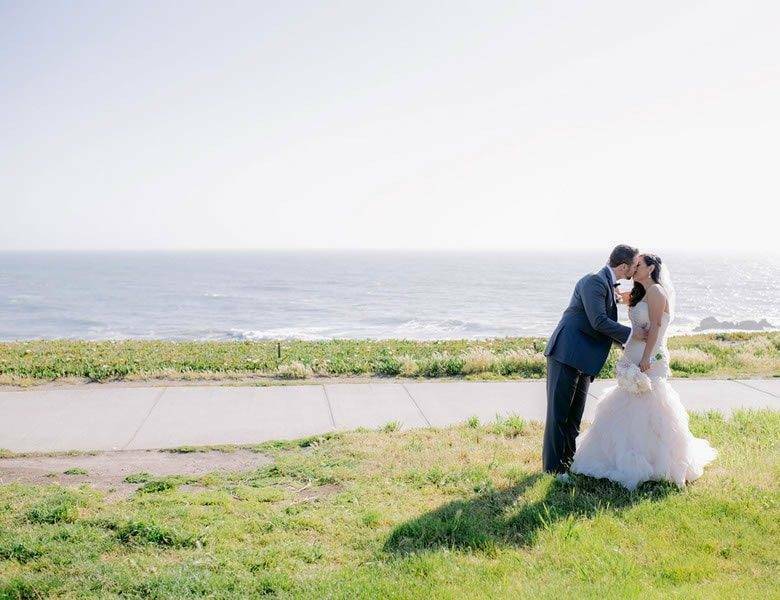 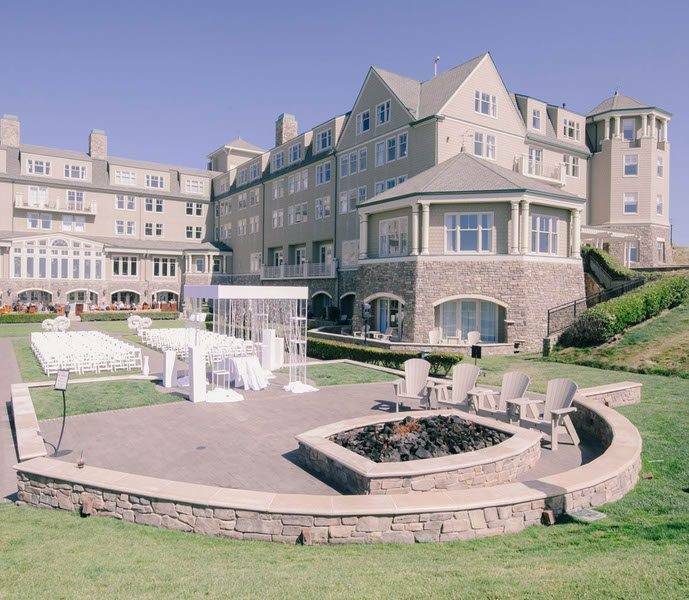 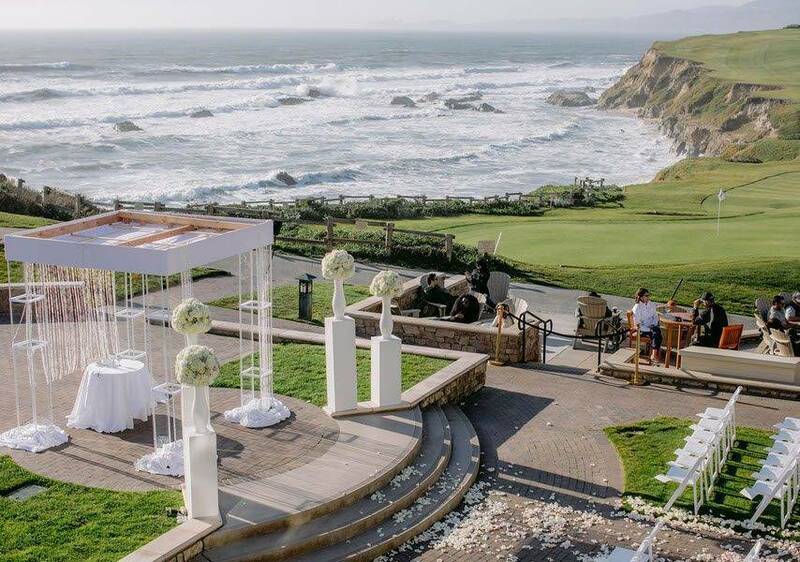 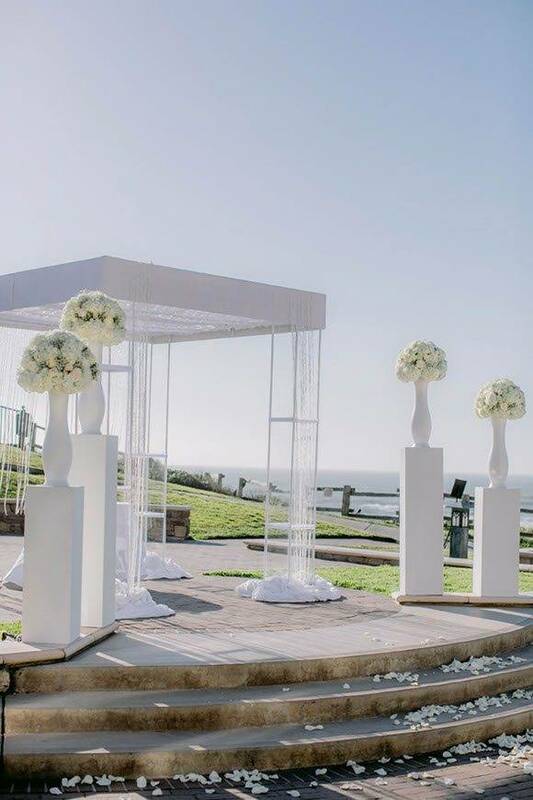 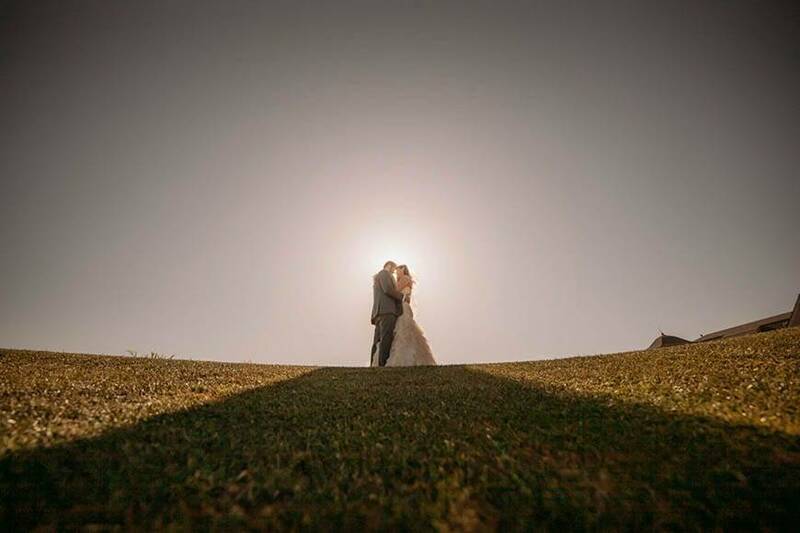 The nuptials took place in a glorious outdoor ceremony on April 30, 2016, on the grounds of the luxurious Ritz-Carlton in Half Moon Bay, California on what the hotel calls its Ocean Lawn because of its incredible view. 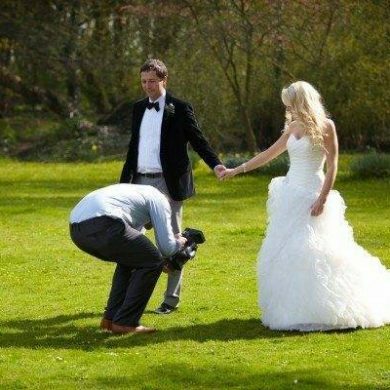 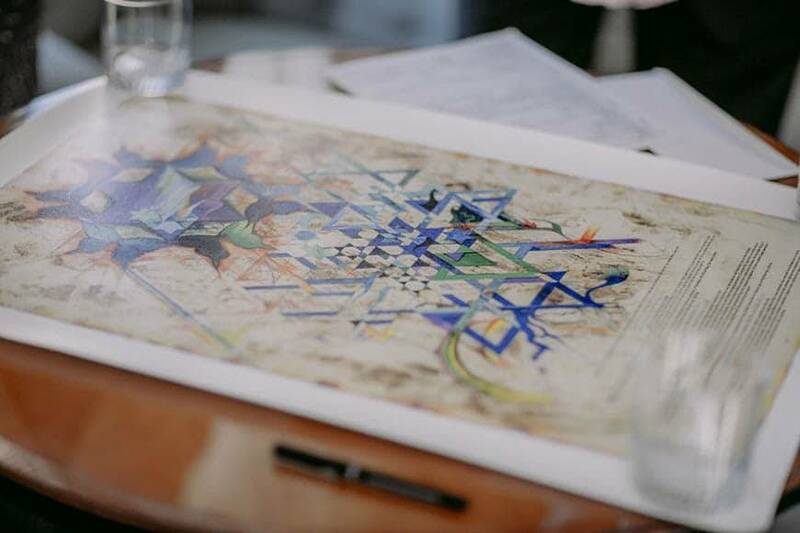 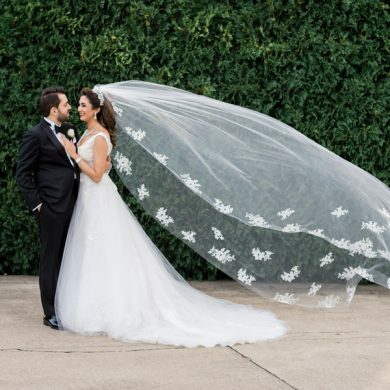 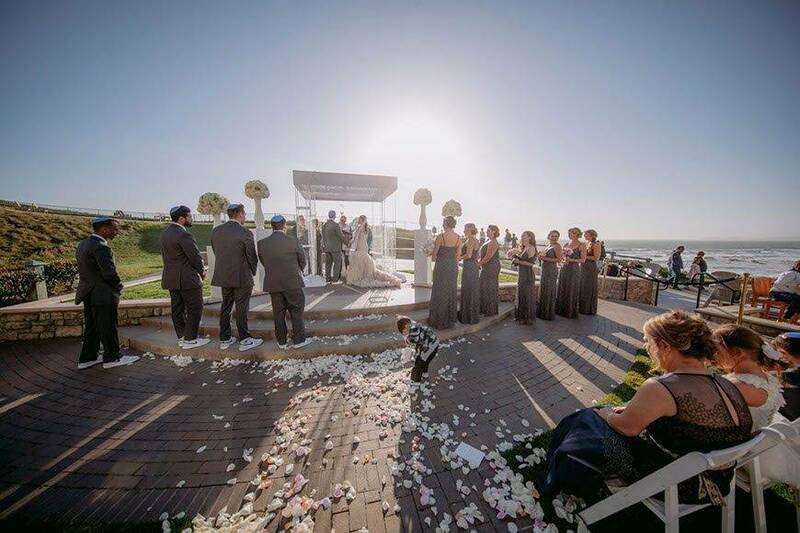 The bride and groom stood beneath a traditional Jewish chuppah during the ceremony, under which the ketubah – a Jewish marriage contract – was signed by them. 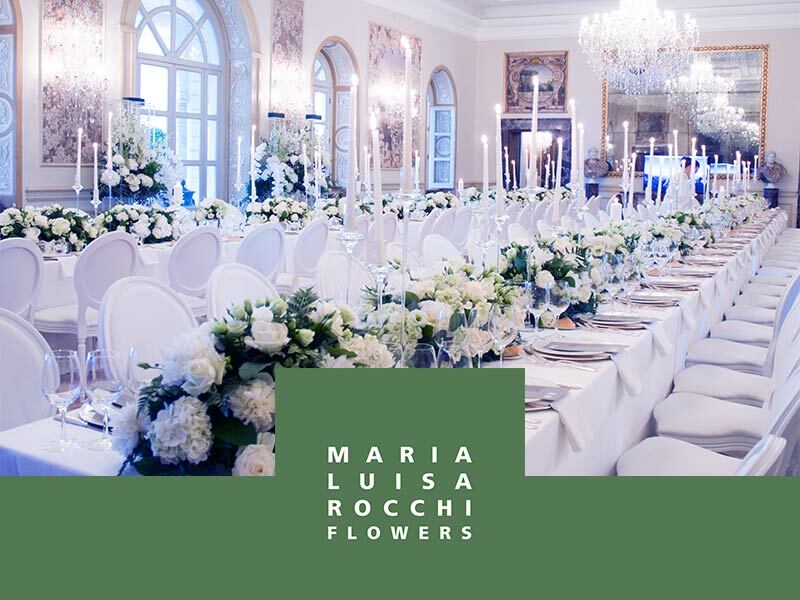 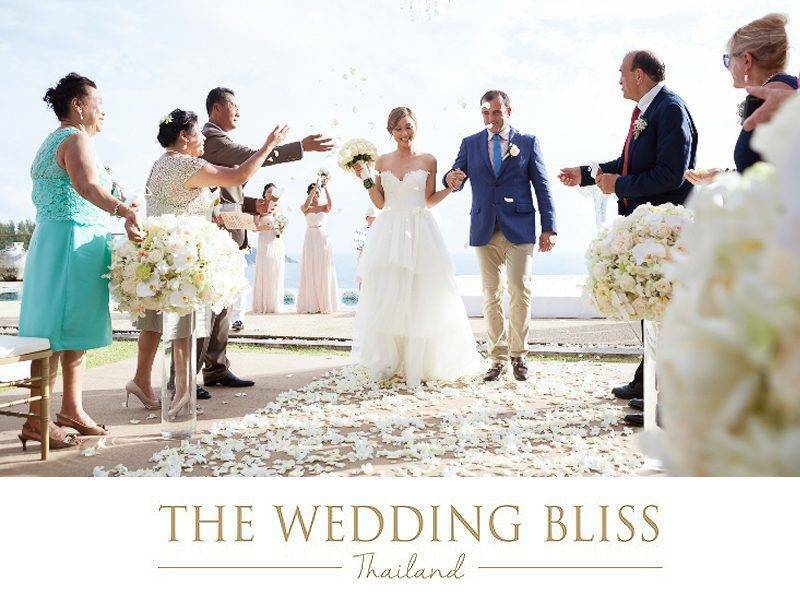 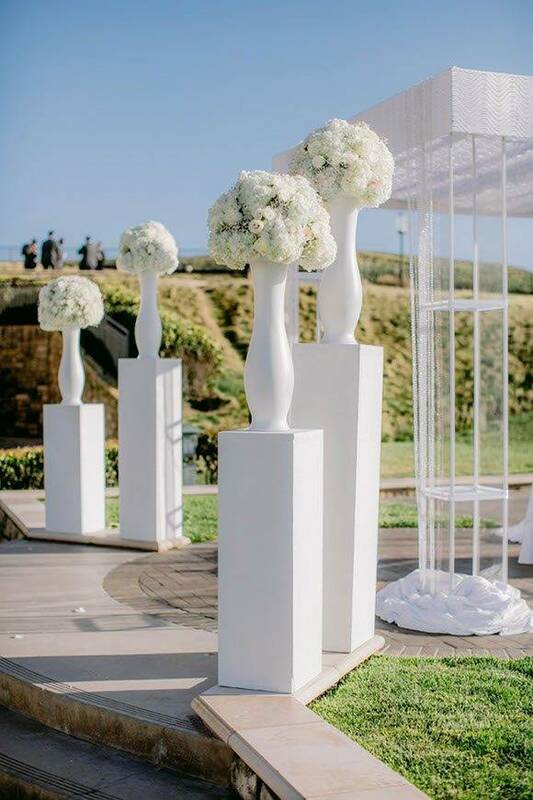 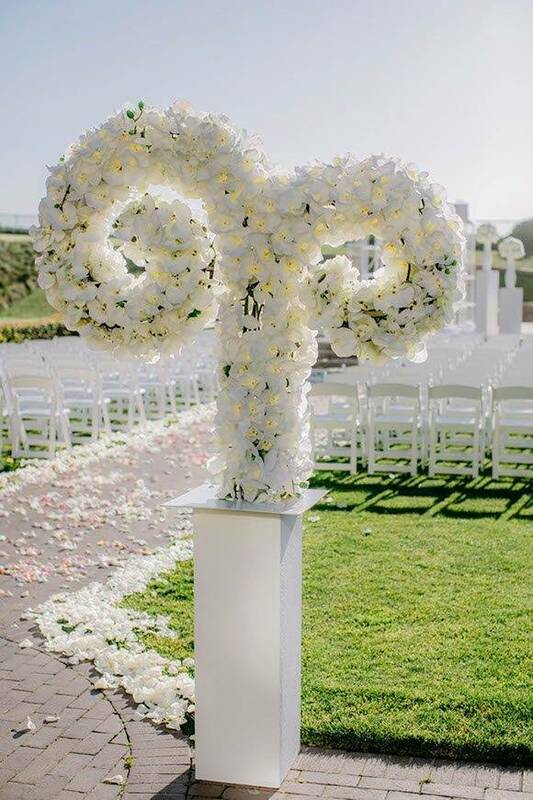 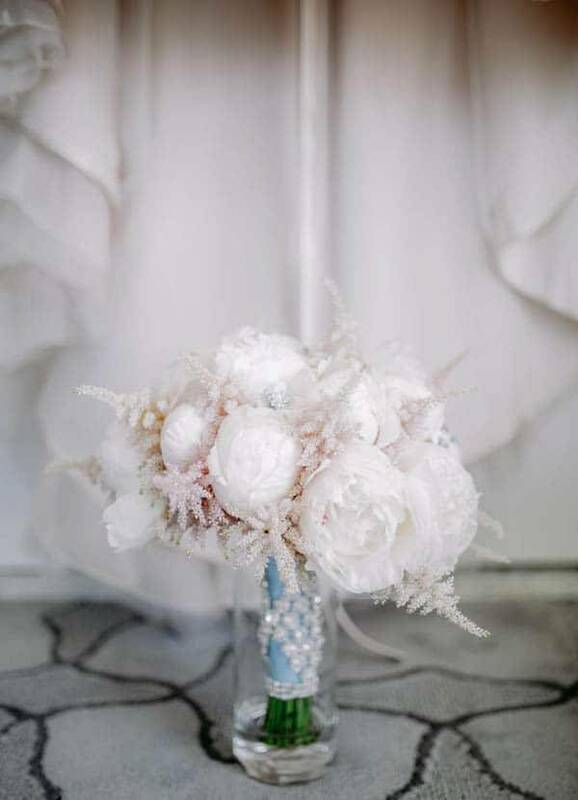 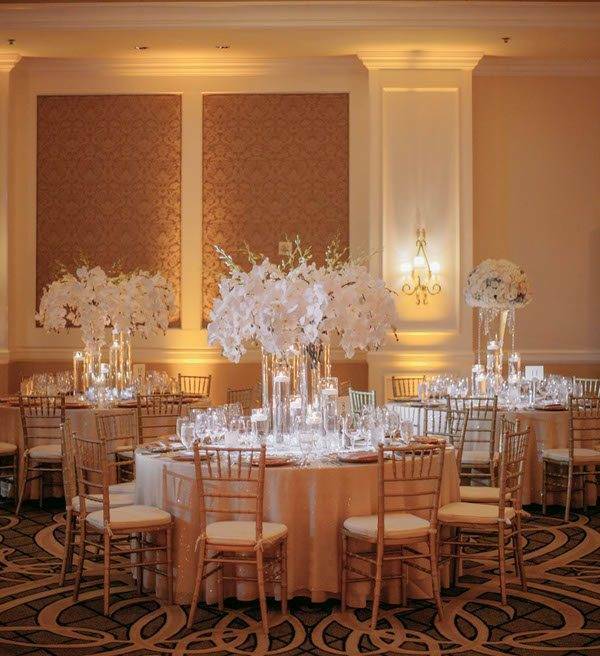 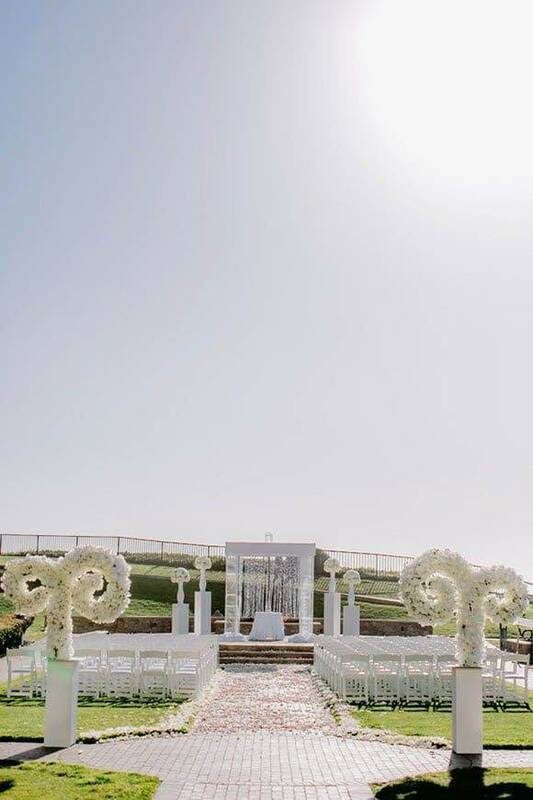 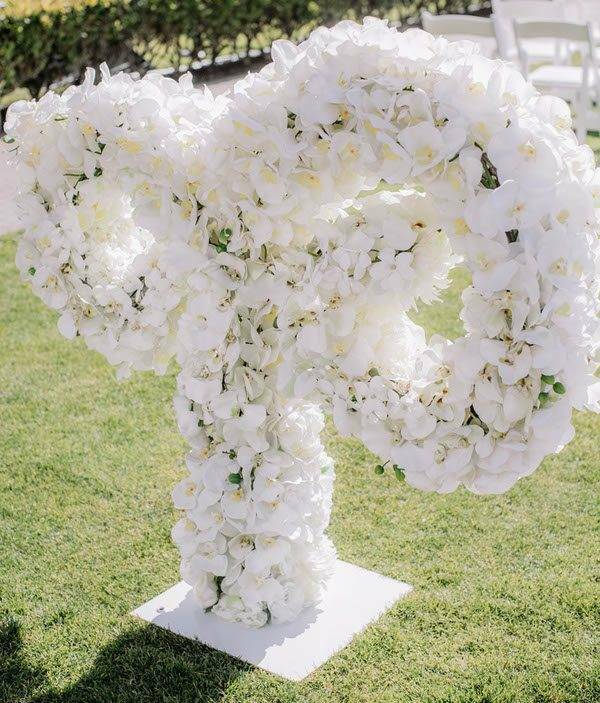 All the décor for the ceremony was white, with guests seated outdoors in rows of white chairs, and more stunning flower arrangements amongst them. 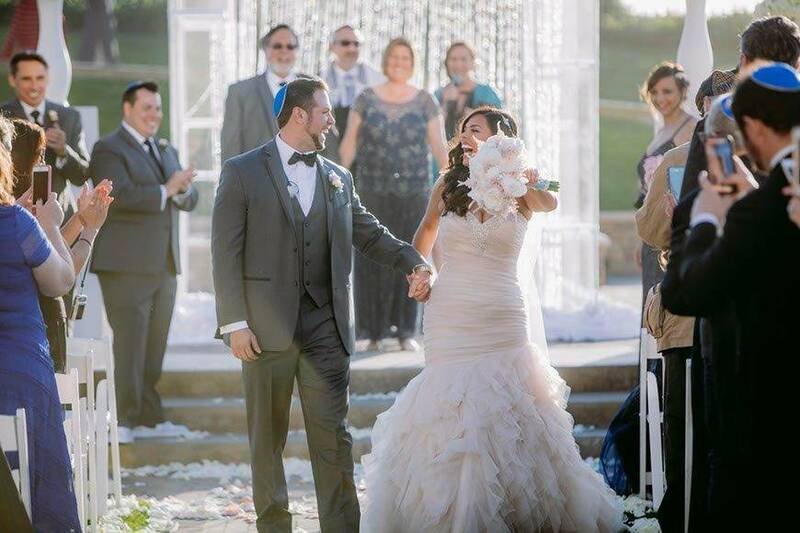 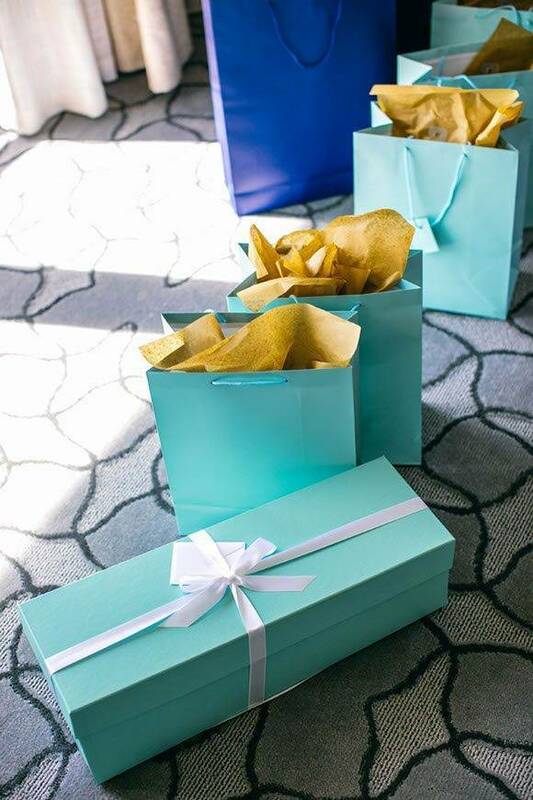 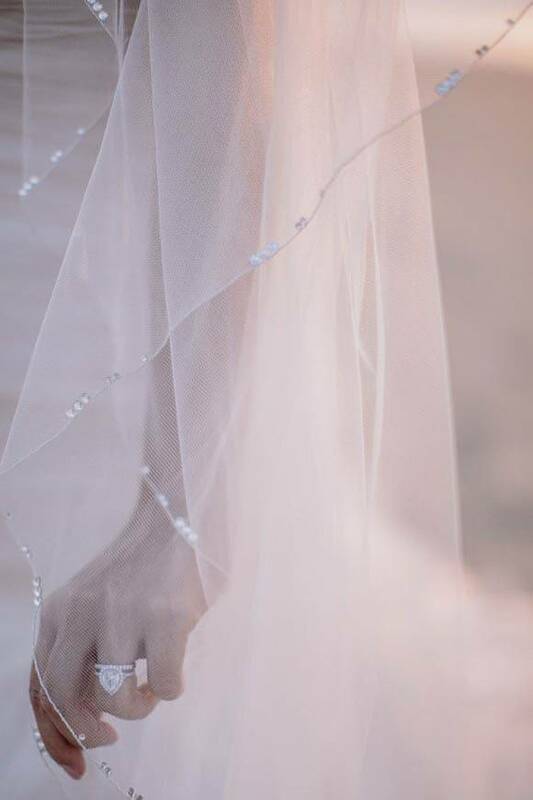 Flower petals lined the floor of the aisle as the bride and groom were presented with their rings. 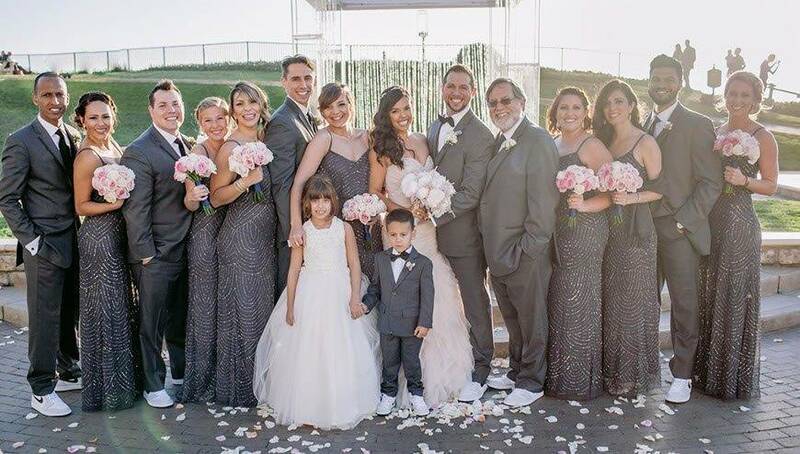 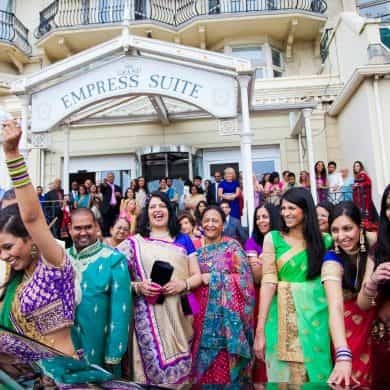 Once the ceremony was finalised, the parties begun to have group photographs taken to remember this joyous occasion, not forgetting the adorable flower girl and pageboy! 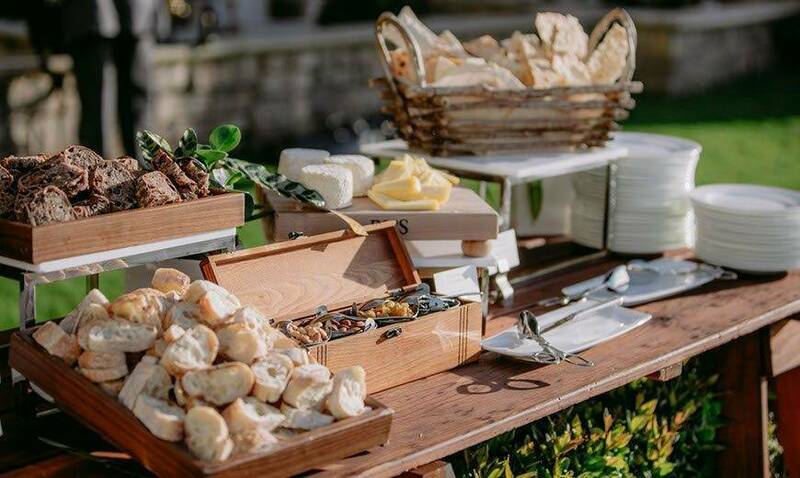 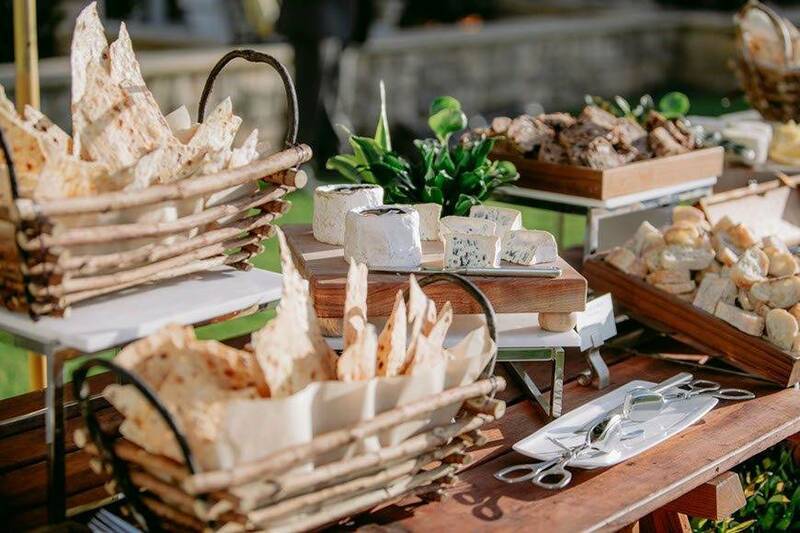 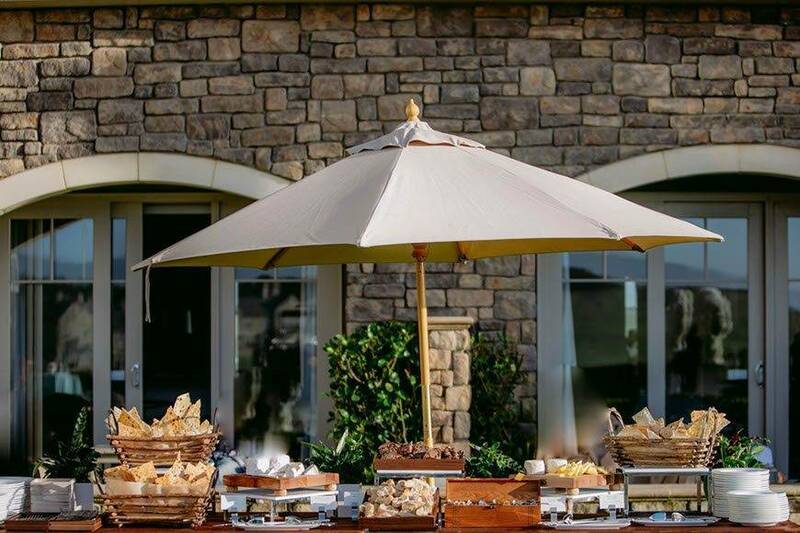 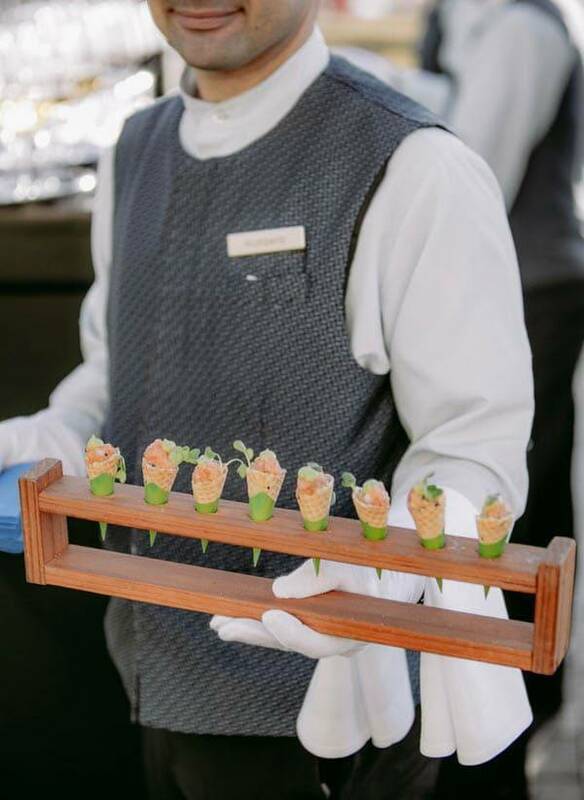 The guests were then treated to nibbles including bread and cheese, served as a small buffet outside, before the reception and meal later in the day. 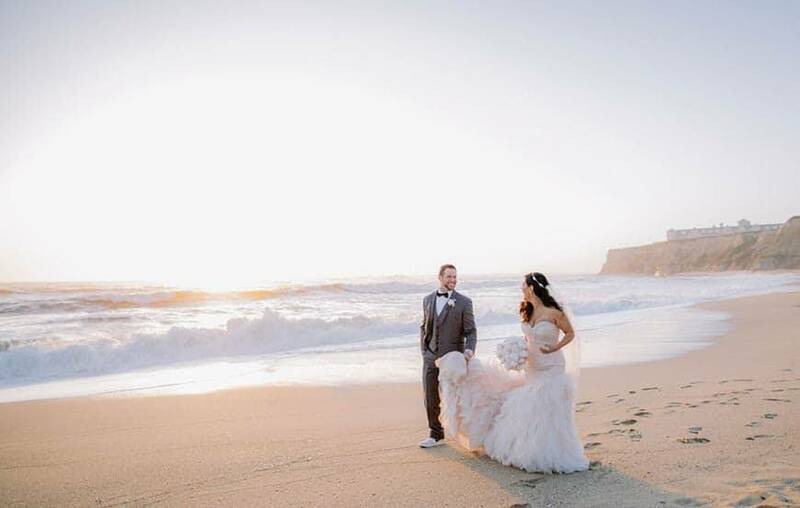 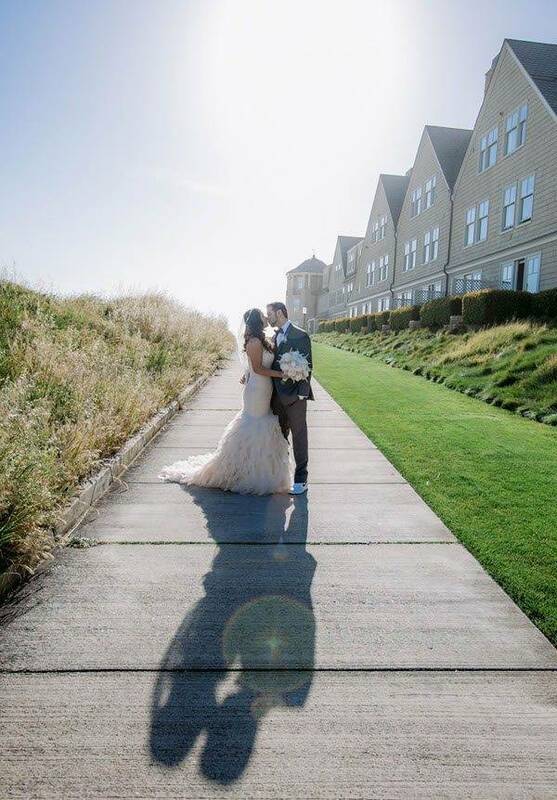 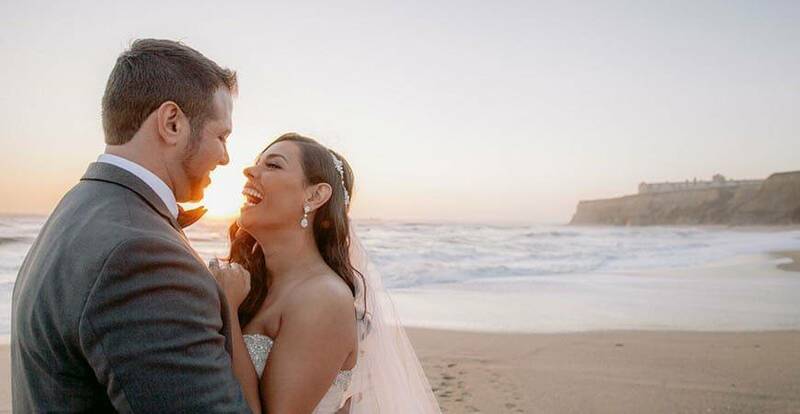 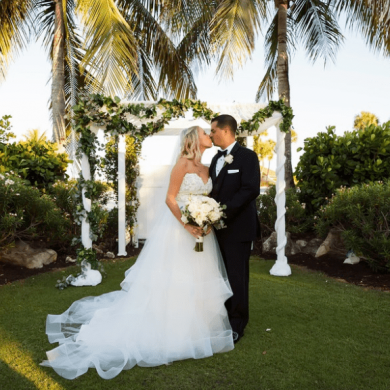 Before the reception was held, the couple took a moment to themselves to have their newlywed photographs taken while walking along the sandy beach below. 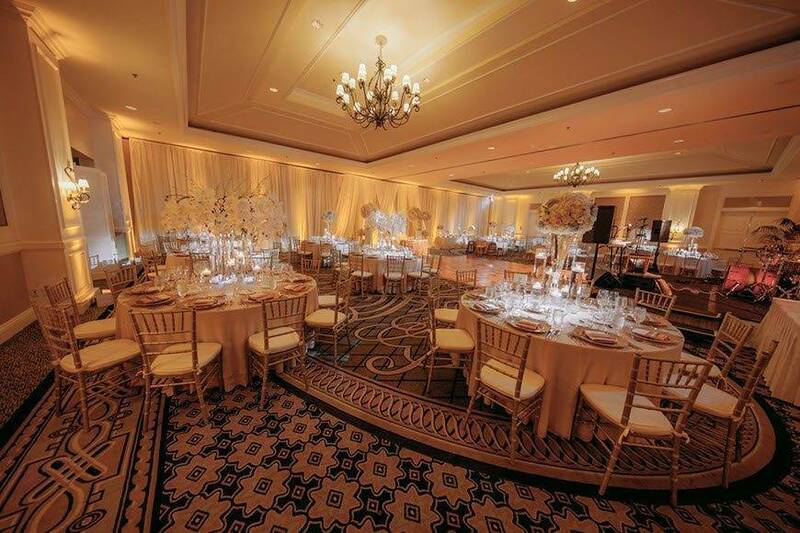 Later in the evening, the reception turned out to be an incredibly luxurious event. 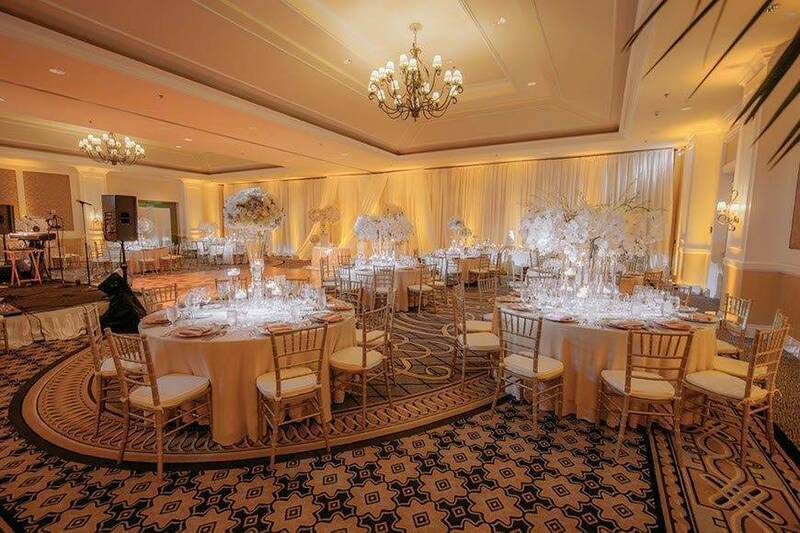 It was held in the grand Ballroom inside the Ritz-Carlton. 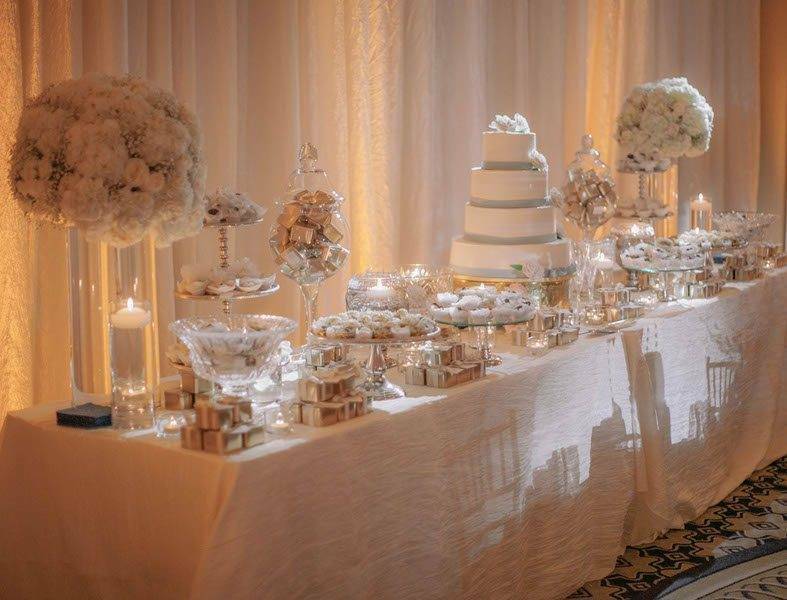 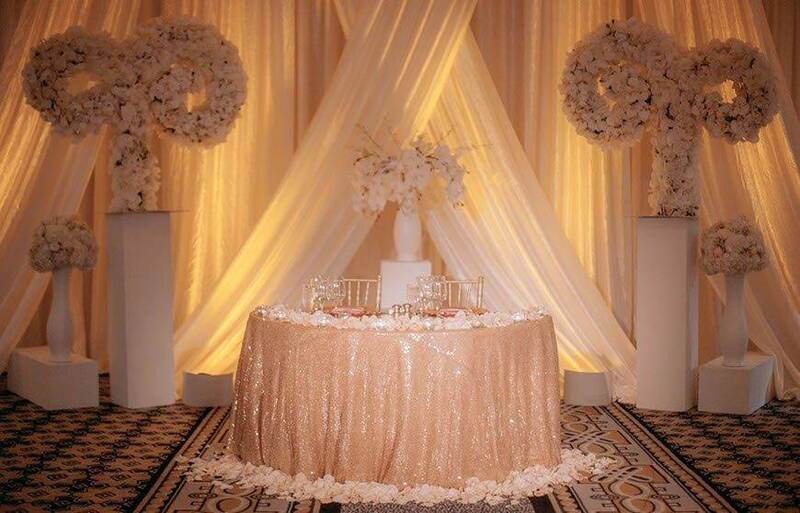 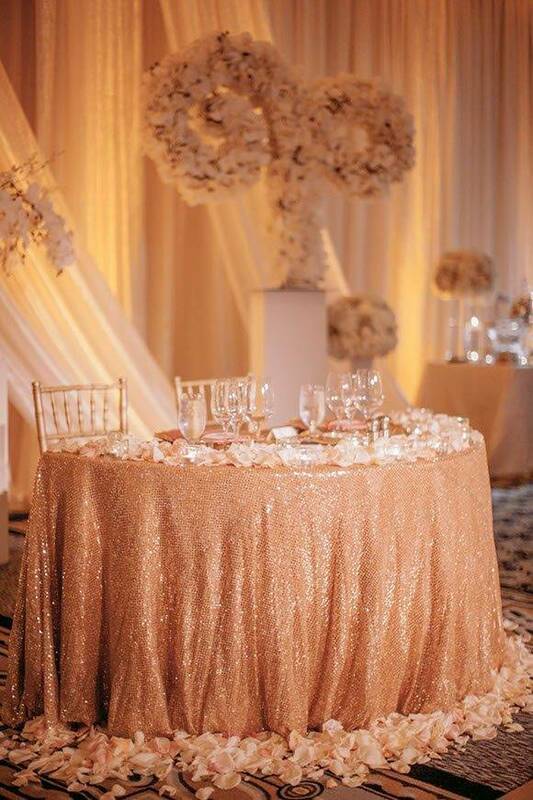 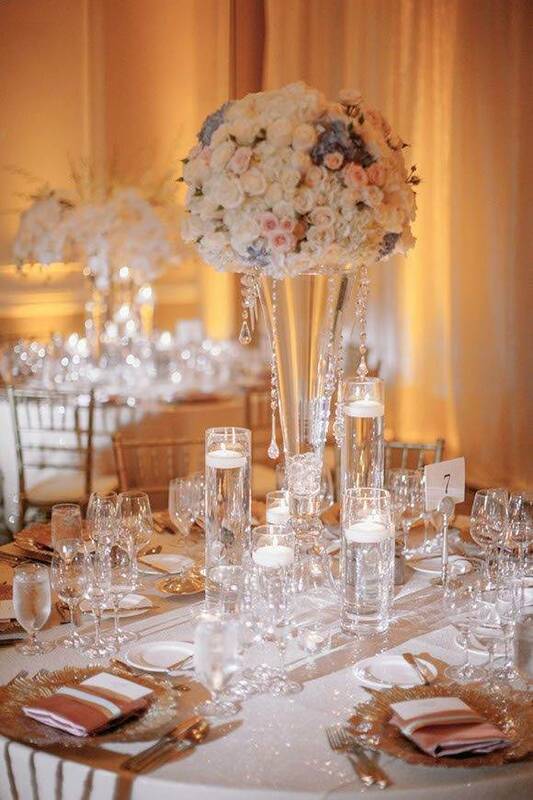 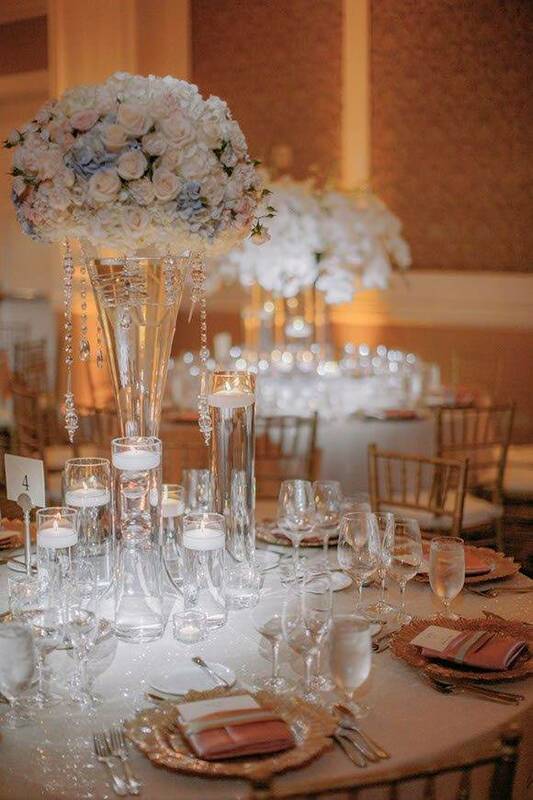 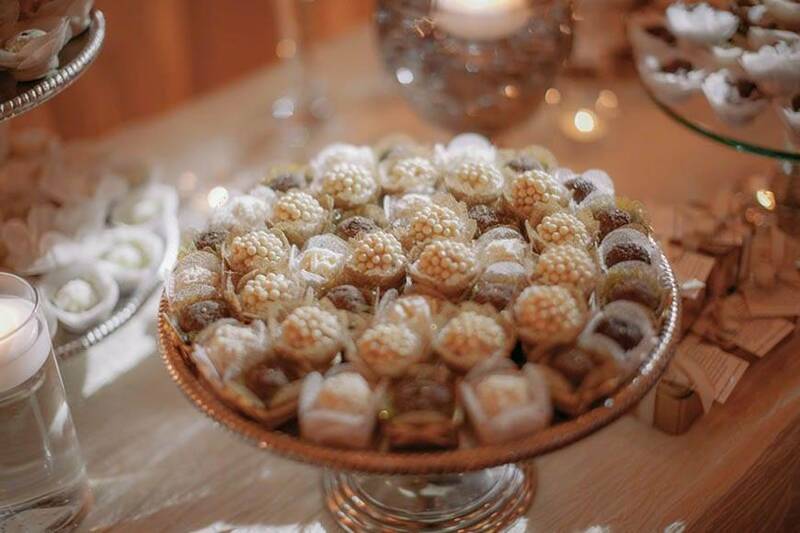 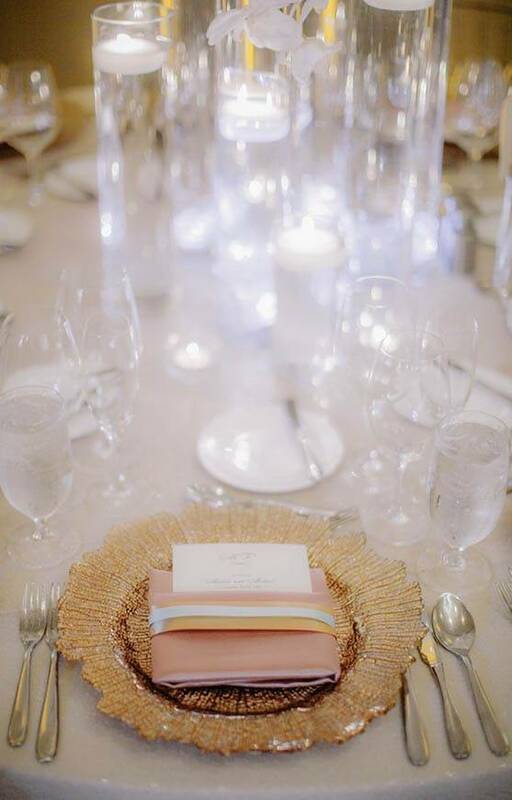 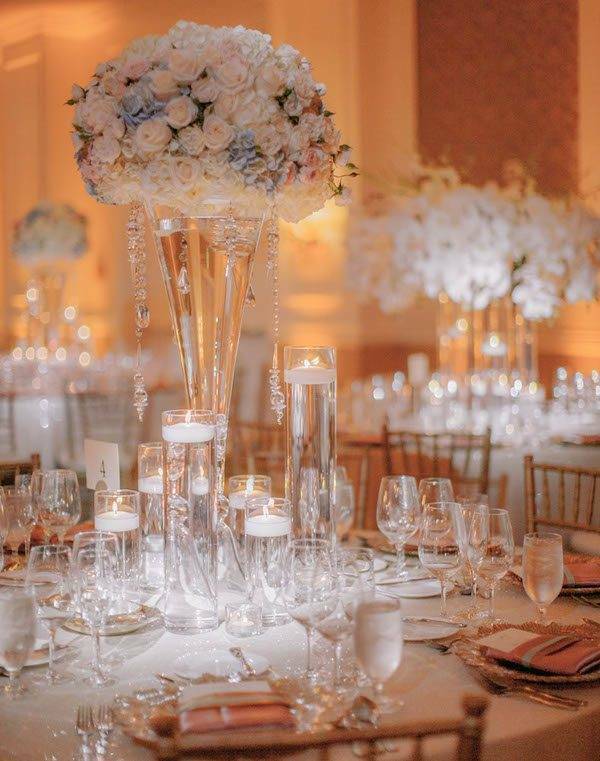 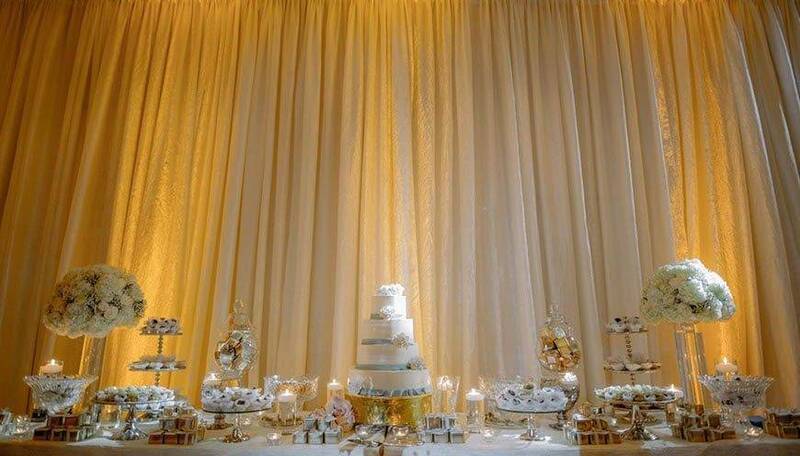 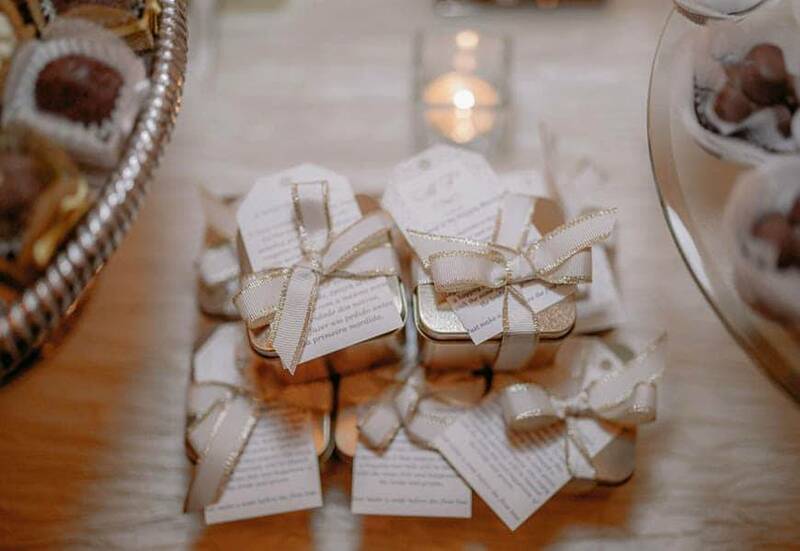 Tables were decorated with as much glass and petals as humanly possible, and the largest table in the room contained an assortment of sweet dessert-like treats for all guests to enjoy at their leisure. 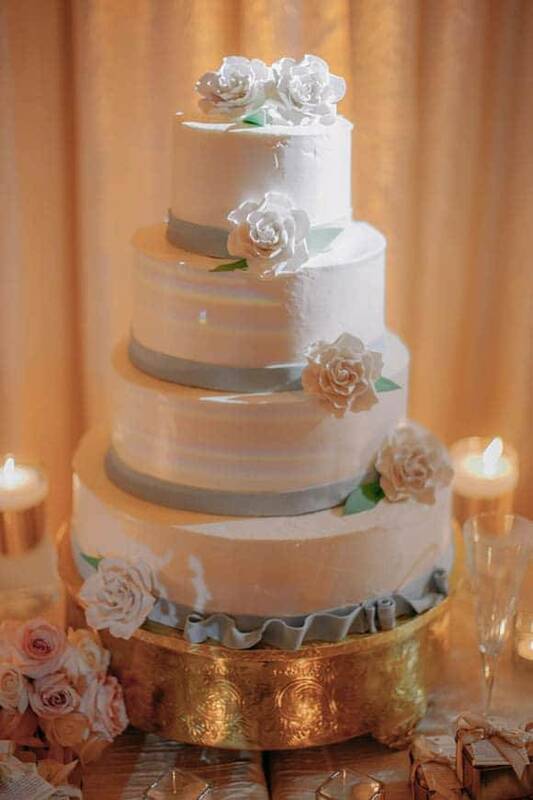 Their cake, from Kathy’s Kreative Kakes, was simple and traditional; a four-tiered white cake with white icing flowers and light blue icing “ribbon” for classy decoration. 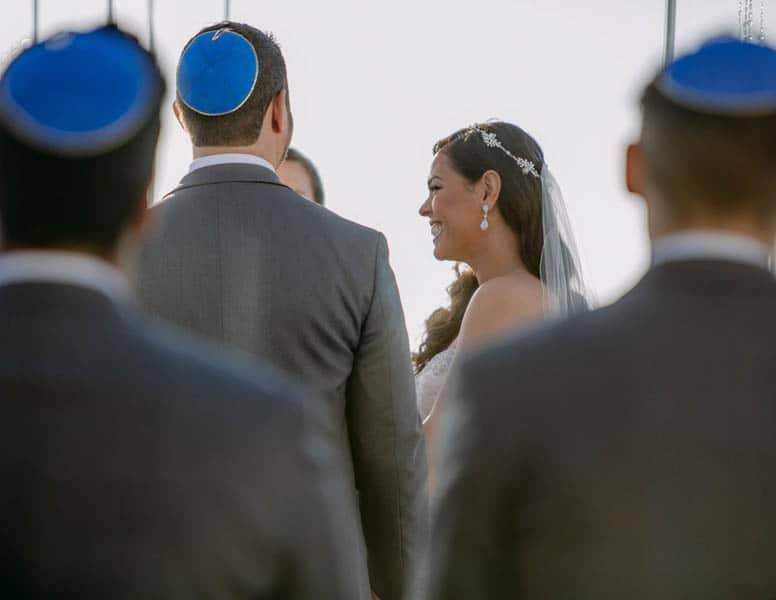 But of course, no traditional Jewish wedding is complete without the Hora! 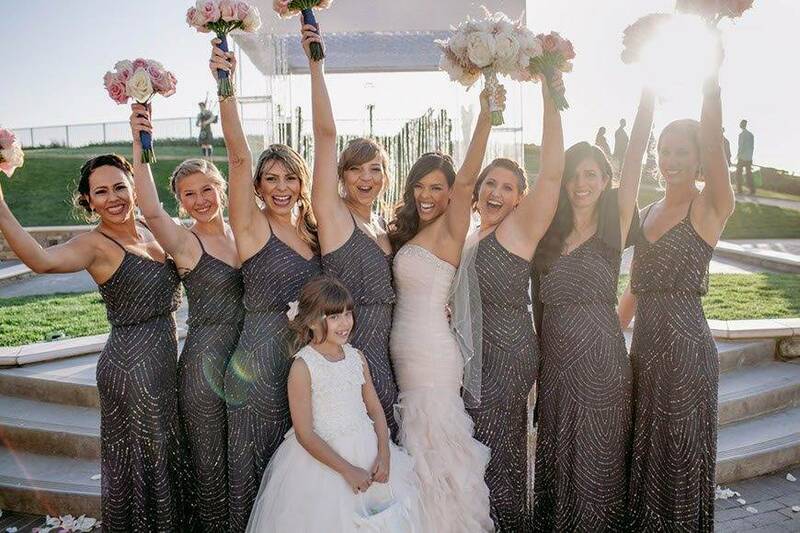 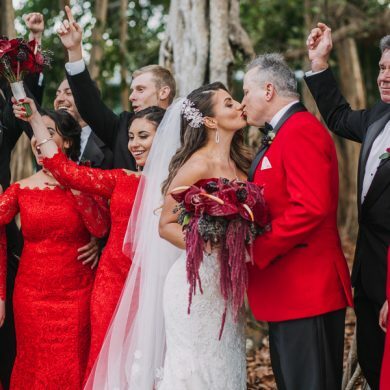 The merriment then begun as the bride and groom are lifted while sated in chairs, while their family celebrate below and the couple try their best not to fall off; Michele in particular appeared to be equal parts ecstatic and terrified! 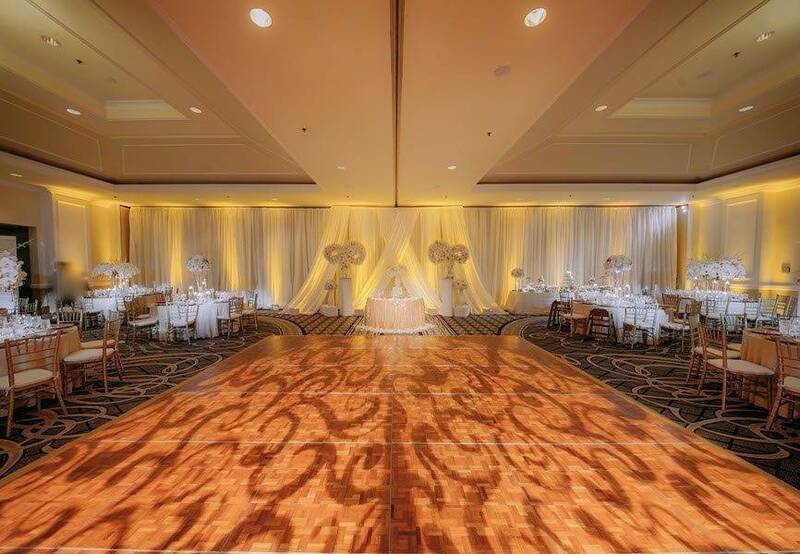 The couple then complete their first dance, with feet firmly on the floor this time, and the guests are then allowed to party the night away to the DJ provided by Gatsby Entertainment. 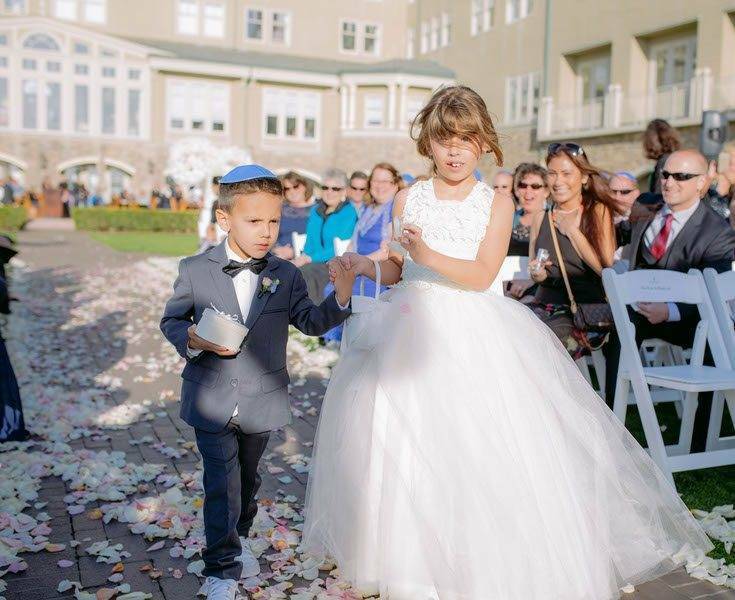 Mazel Tov, Michael and Michele!